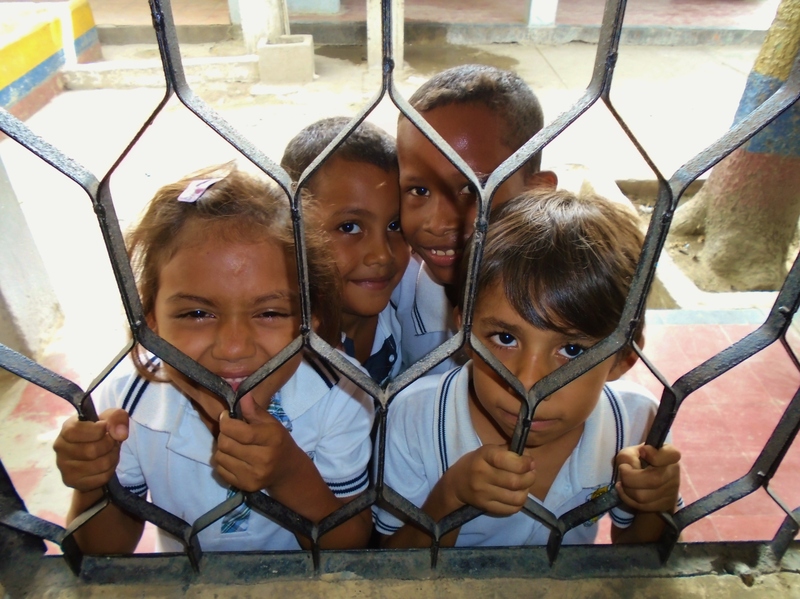 Peace Corps Por Favor! | "Do it with a heart wide open." I have been back stateside for about six months now and I can’t believe how quickly the time has passed! 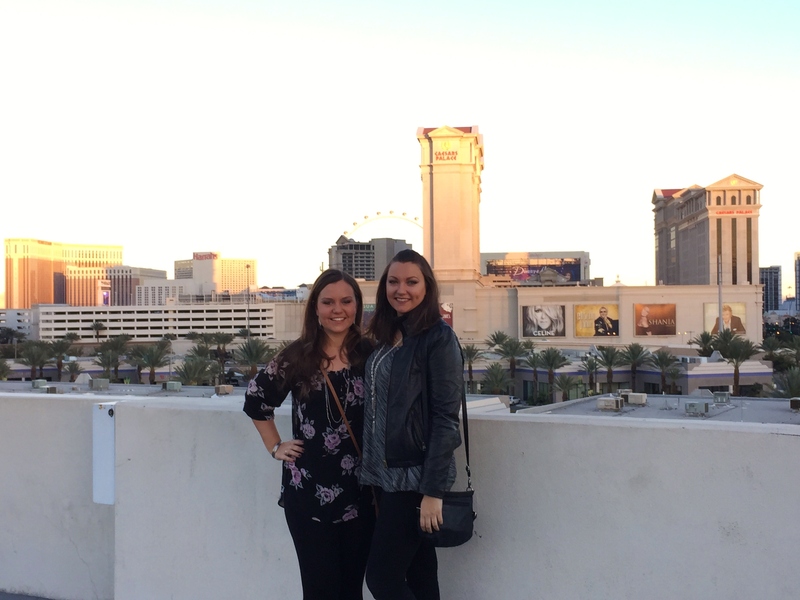 I have been spending time with people I love and enjoying the beautiful Phoenix weather (until about two days ago when it became deathly hot)! I just finished up the school year at a charter school where I was working as a long term substitute teacher in a Spanish classroom. 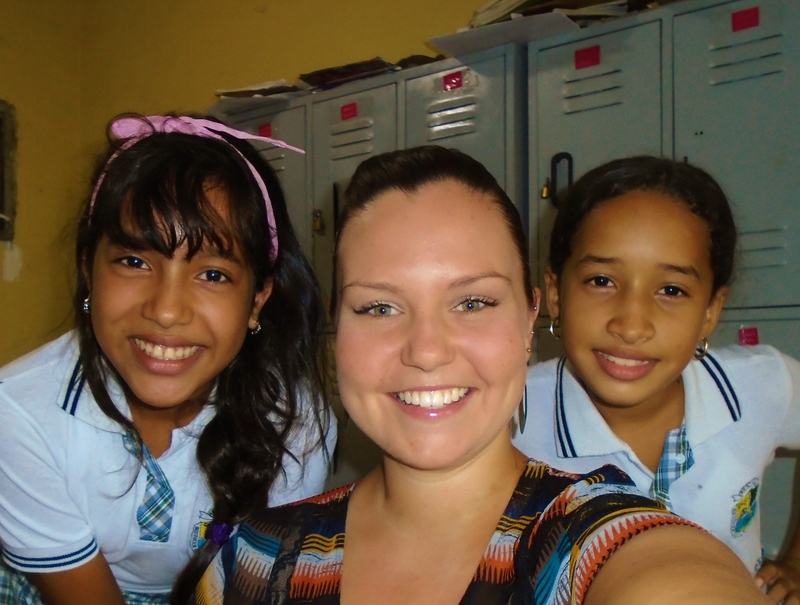 I taught grades 3-8 and it was a really great opportunity for me to experience something a little different! 1. 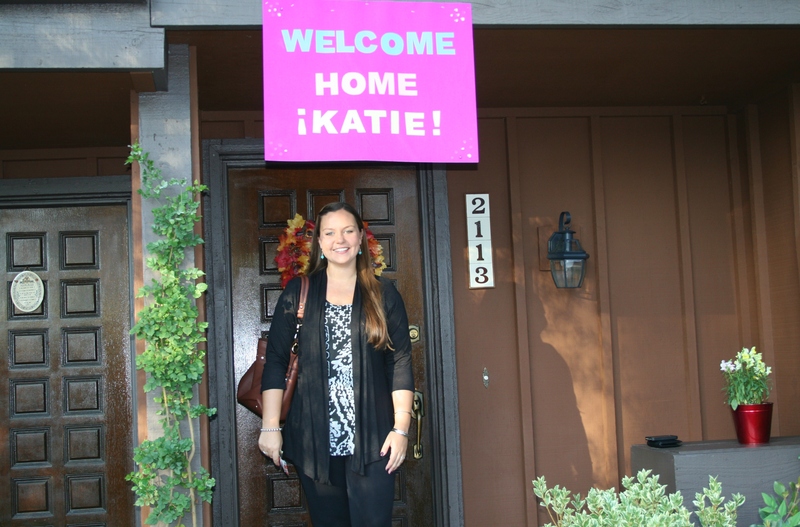 Visiting the best friend in her new home in California. 2. Enjoying some live music and beautiful Arizona sunshine at the Cultivate Festival. 3. Quick trip to San Francisco where my little sister interviewed for (and later accepted) a job as a flight attendant with Virgin America. 4. Spending time with my beautiful mama! 5. One of my favorite views from an early morning hike near my house. I keep in touch regularly with my family and friends in Colombia. Starting in the fall I will be teaching informal English classes via Skype to my host cousins (and in exchange we will converse in Spanish to keep my skills sharp!). 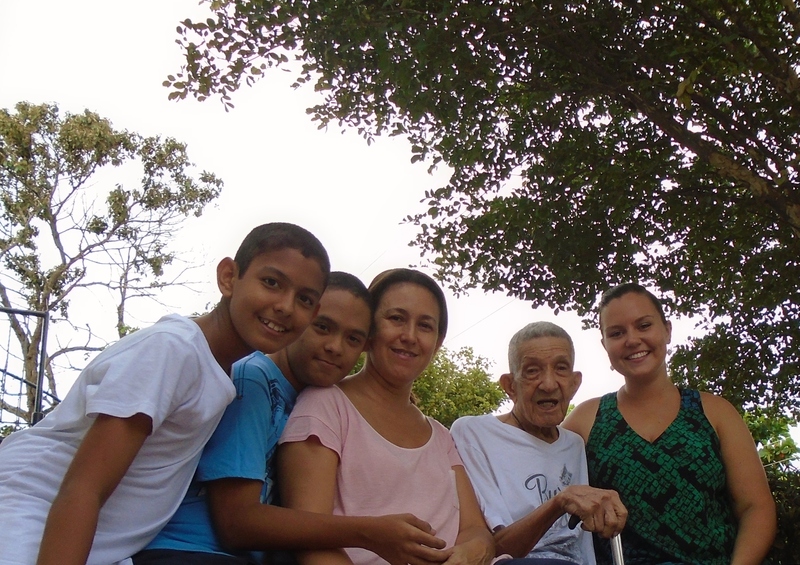 My abuelo is still doing great and the rest of my family is happy and healthy as well. 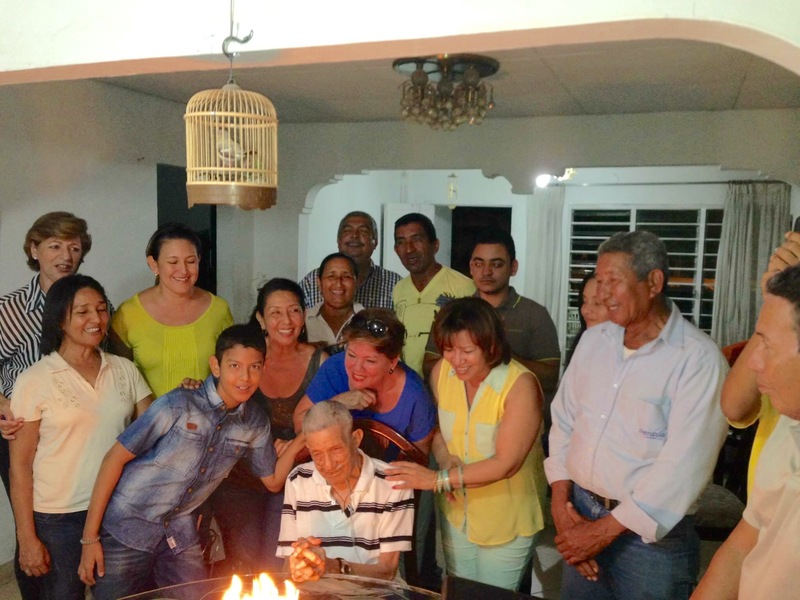 The family celebrating my abuelo’s 96th birthday back in April! I have been waiting until everything was finalized to share my plans for next year, but now that I have signed a contract for my job and a lease for my apartment I guess it’s about as final as it can get! I am excited to announce that at the end of this month I will be moving to Denver, Colorado where I have accepted a job teaching kindergarten ELA! 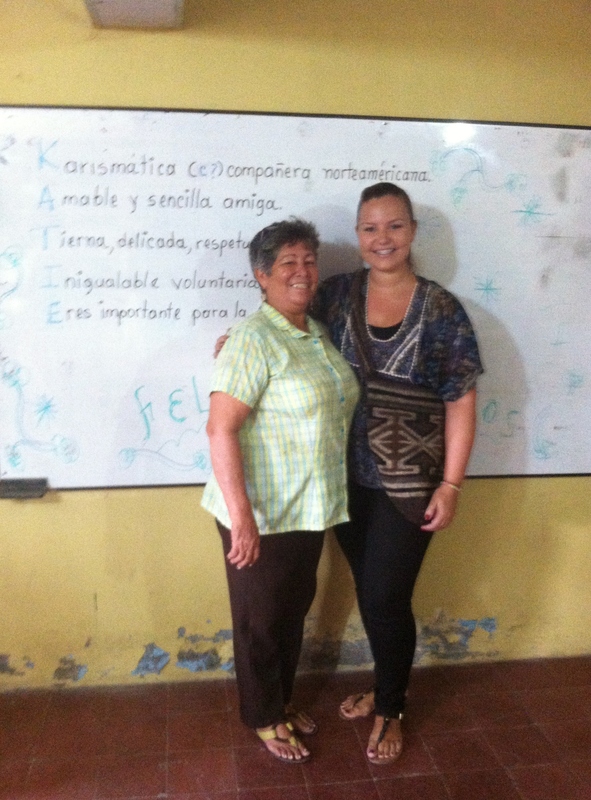 Also, by complete coincidence, I happen to be working at a school where one of the other volunteers I served with in Colombia teaches. Talk about a small world! The job is a perfect fit for my passions and skill set and I think that I will be very happy living in Denver. I already have a list about a mile long of all the places I want to hike (and a second list nearly as long of places to do happy hour!). 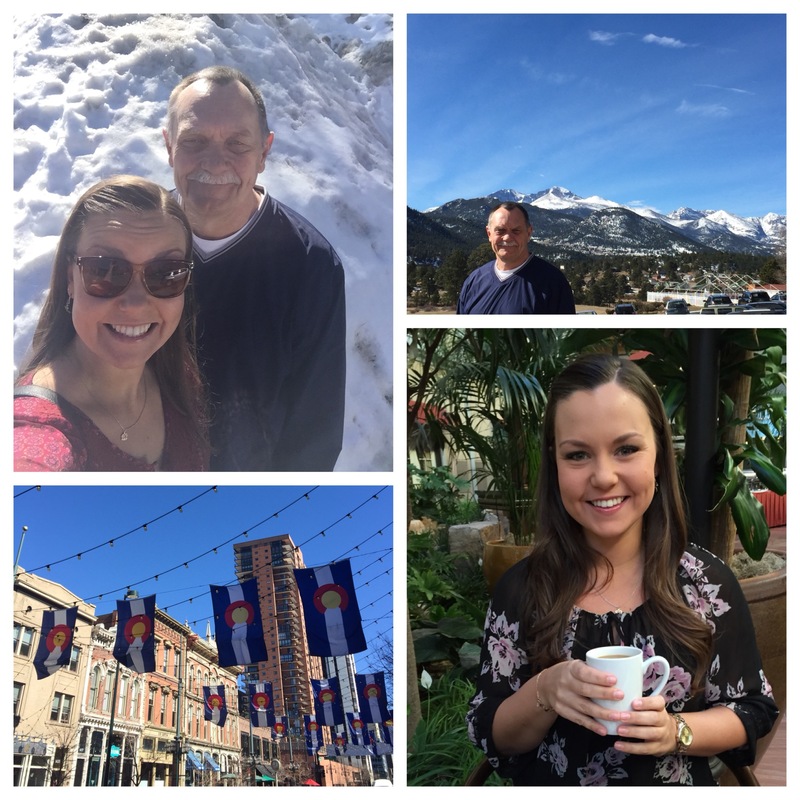 My Dad joined me on a spring break trip to Colorado to check out schools and apartments back in March! Now that all of the updates are out of the way, it’s time to do something I have been putting off for six months. 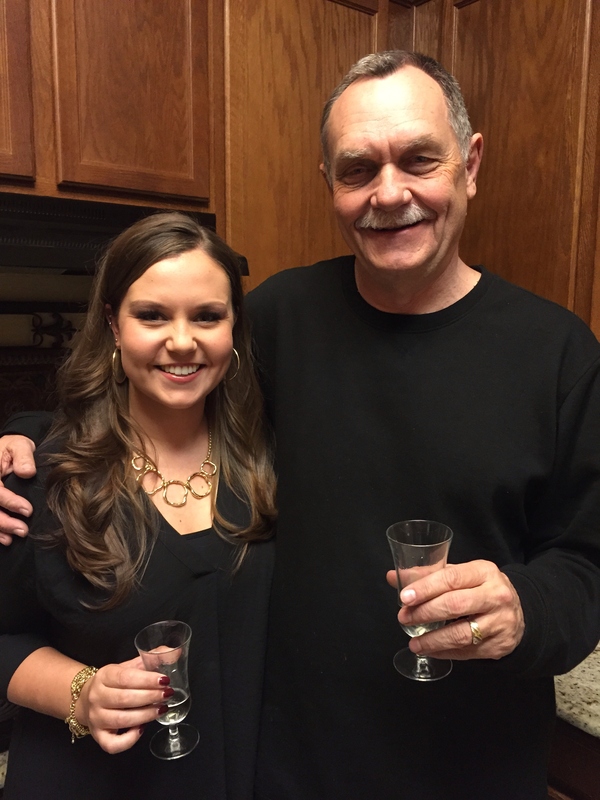 Writing a final post for this blog, for me, brings this chapter of my life to a final close. 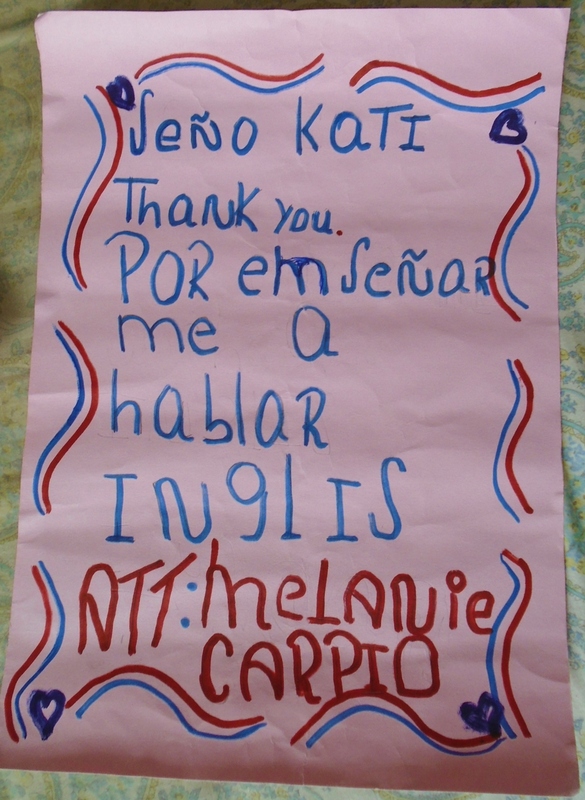 All along I imagined writing one last entry that summed up my Peace Corps service into a concise and moving account of how it was a life changing experience and how Peace Corps really is ‘the toughest job you’ll ever love’. Now here we are, the time has come for the epic end all post, and while both of those things are true, they just don’t seem to do the experience justice. I struggle to find the words to explain just how much it meant to me or how it impacted the person I am today. In one sense, it doesn’t seem that much different than any other two year segment of my life. I had many personal milestones, plenty of failures, professional achievements, and my fair share of boredom too! Yet because these two years took place on another continent in a different culture, there is this expectation that I have neatly packaged insights that I can easily and eloquently relay when people ask, “How was Colombia?” I have plenty of interesting stories, which I enjoy sharing, but in the same way that the hamburger you had for dinner last night doesn’t define your whole week, those iguana eggs I had with my family—although an amusing story—in no way represents the experience I’ve had as a whole. 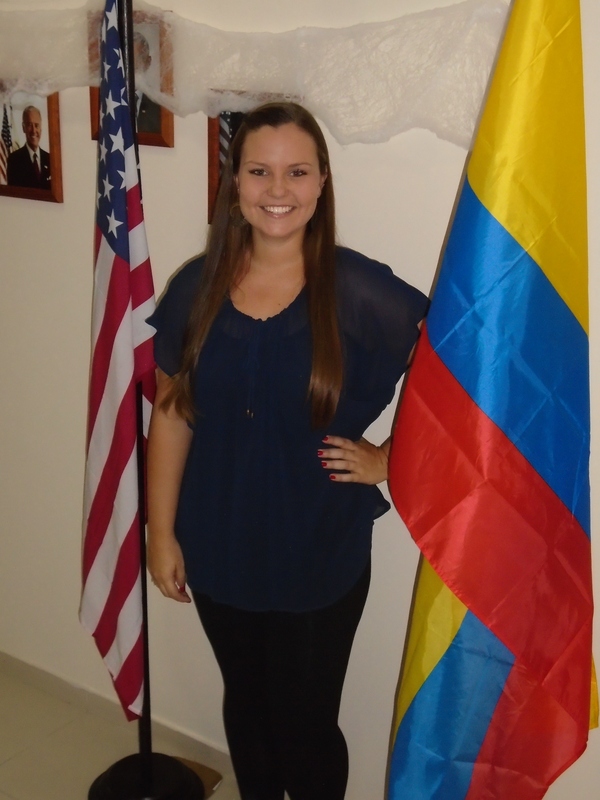 I feel a heavy responsibility in summarizing my experience, because in telling my story, I also tell Colombia’s story. 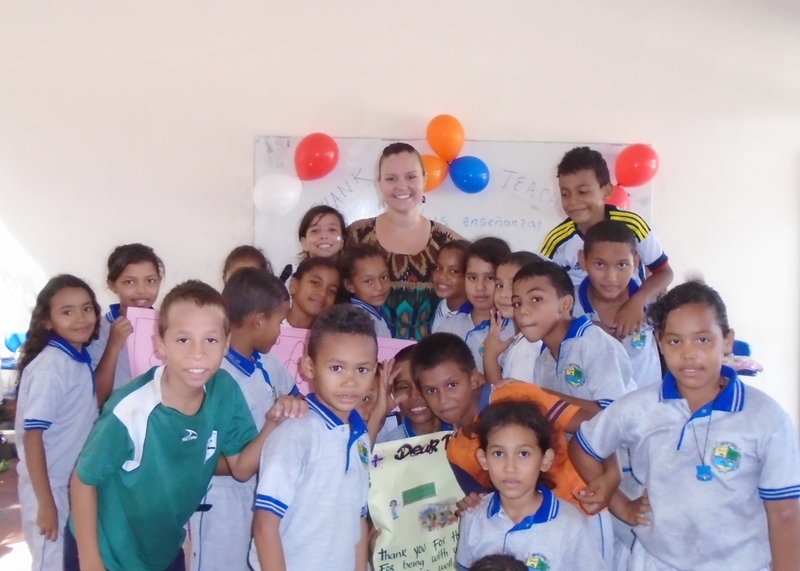 What I can say is that there were highs and there were lows, but serving in the Peace Corps and dedicating two years of my life to living, learning, and loving in Colombia was the best decision I have ever made. It had been a long time dream, and I am so glad that despite setbacks, I made that dream a reality. Colombia and the people I met there have touched my heart and inspired me in a way that I have never experienced before, and I will be forever grateful for my time there. 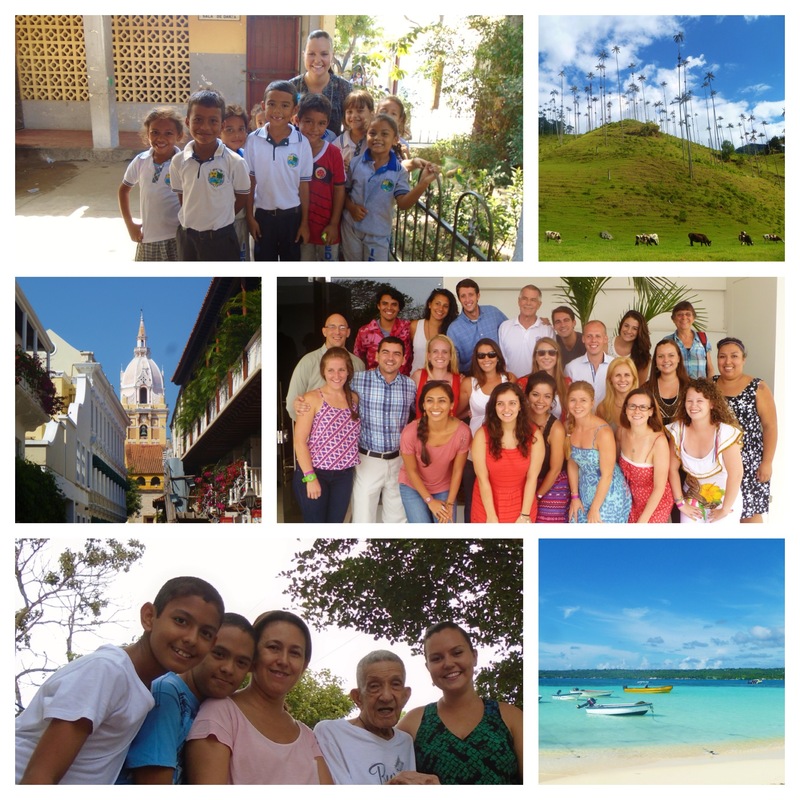 To the Peace Corps staff, my fellow volunteers, my Spanish teachers who sparked a desire to experience the world, my family who supported me throughout the journey, and most importantly, to the people of Colombia…..thank you from the bottom of my heart. Just a few of the people and places that will always hold a special place in my heart. To everyone who has been reading over the past three years, thanks for being a part of the journey. Life is so beautiful and I am so glad I was able to record and share bits and pieces of it through this blog. This is the end of one adventure, which can only mean the beginning of a new adventure is on the horizon. Whatever adventures await you, remember “Wherever you go, go with all your heart”. One last time……paz y amor. 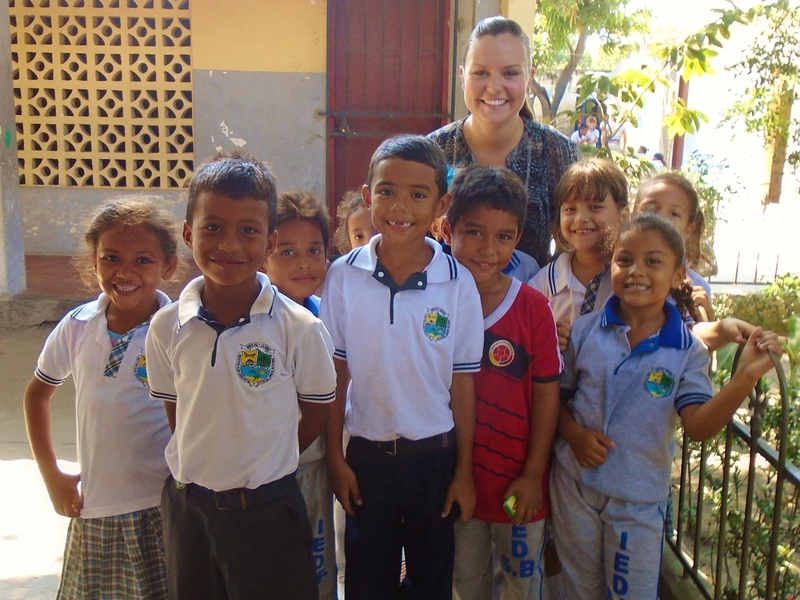 Life as a Returned Peace Corps Volunteer! Happy New Year! 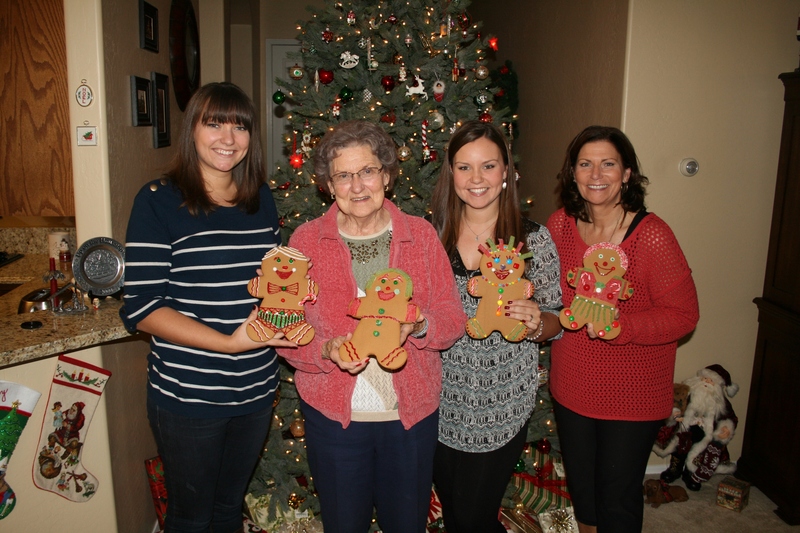 I hope that everyone had a wonderful holiday season with friends and family! 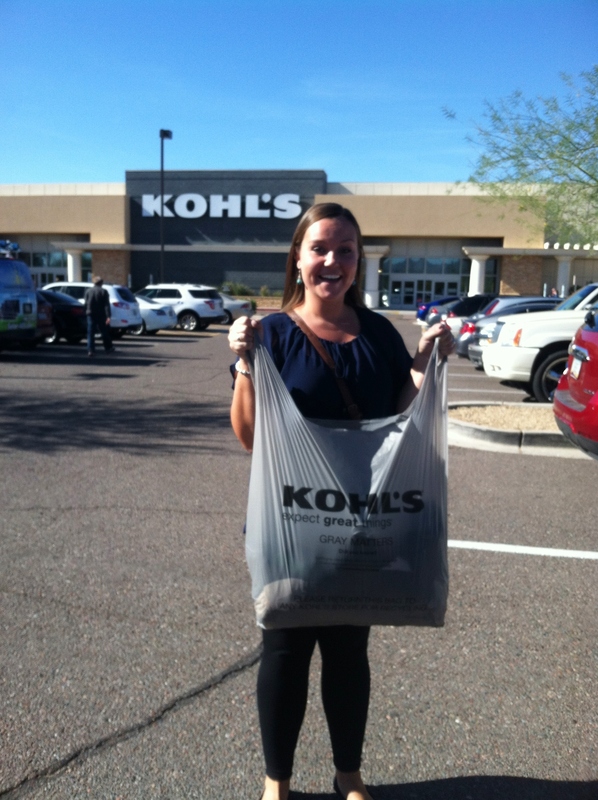 I am writing to you from beautiful Phoenix, Arizona! I have been back in the US for nearly two months now and the time has absolutely FLOWN by! I have been busy catching up with friends and family, enjoying the holidays, and getting my feet back on the ground after two years away. My three favorite people waiting at the airport! You know the saying ‘a picture is worth a thousand words’, so here are some pictures of the highlights from my first two months back in the US! 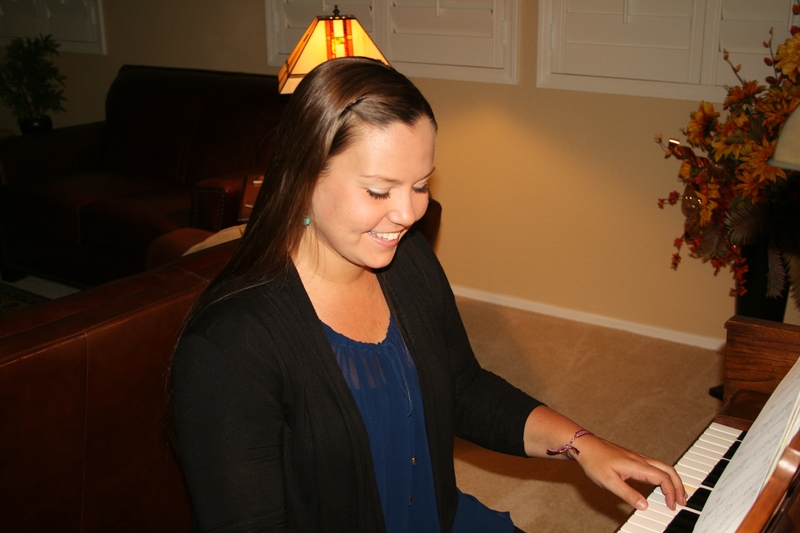 Hadn’t touched a piano in over two years…so happy! 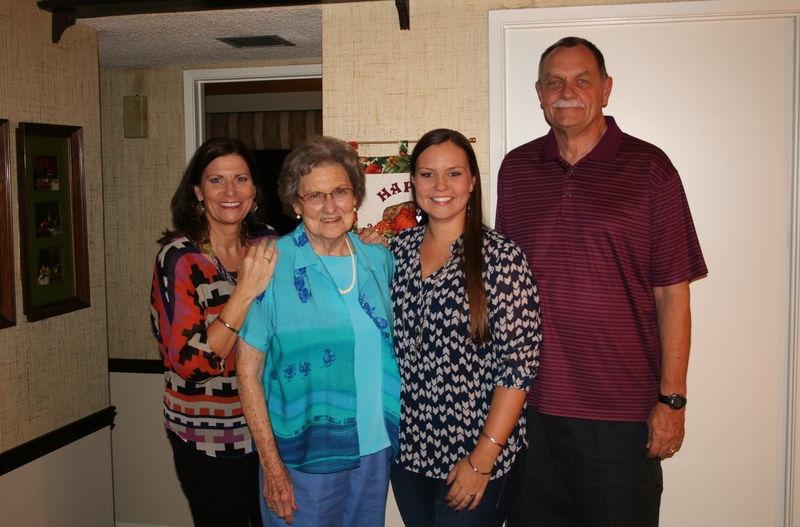 Reunited with Grandma just in time to celebrate her 89th birthday! 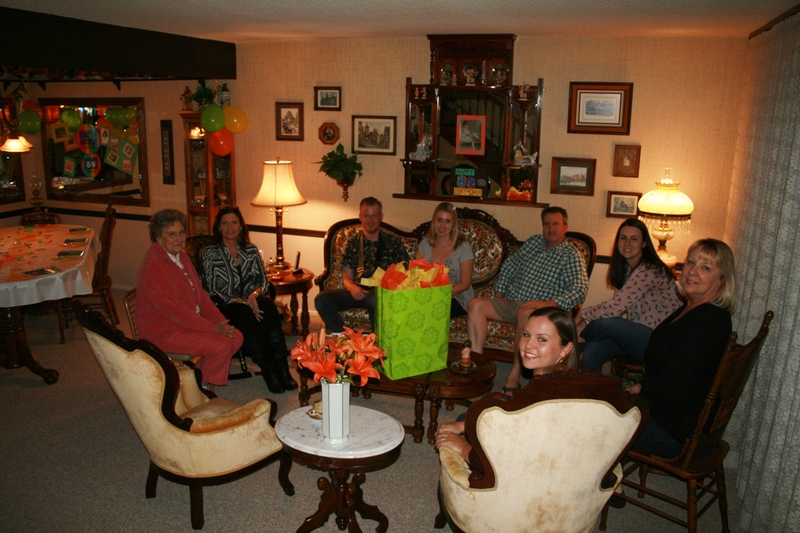 Thanksgiving/Birthday celebration with the family in California. 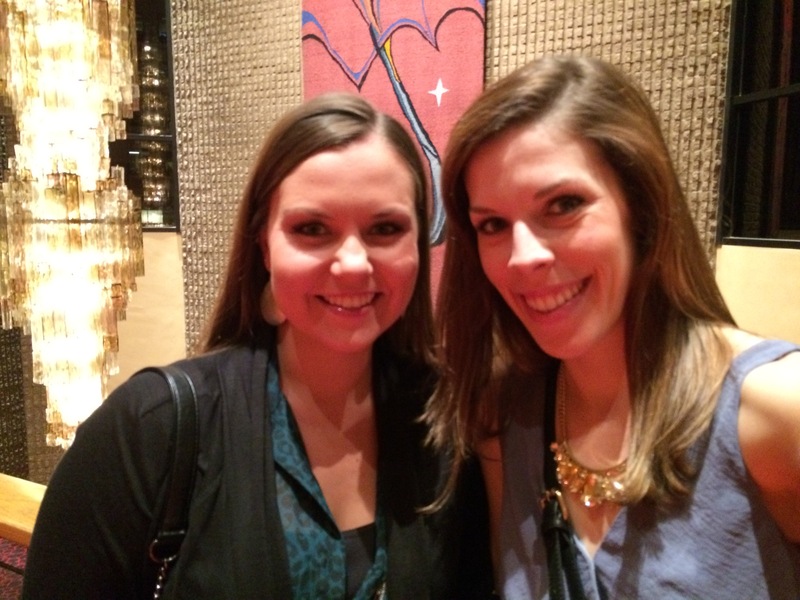 Reunion with the best friend at the Andrew McMahon concert! Back at it with my partner in crime. 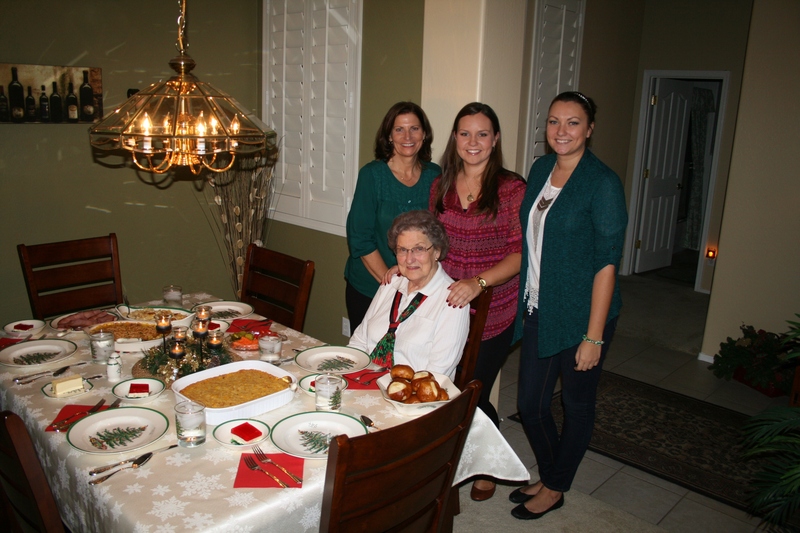 The ladies at Christmas dinner! 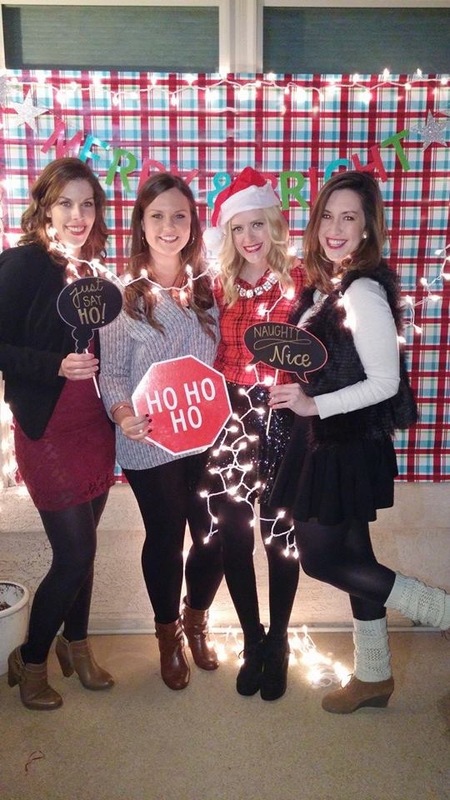 With my favorite ladies at Friendsmas! 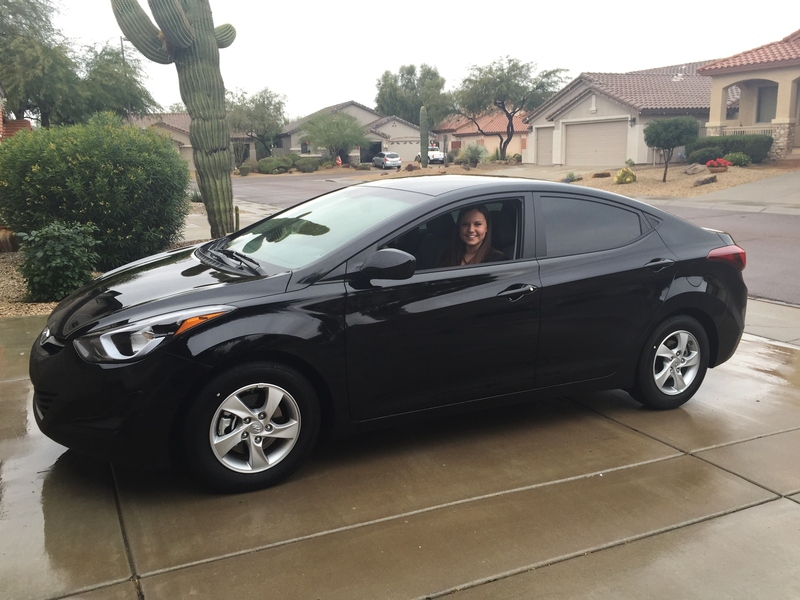 Bought my first ever new car, a 2015 Hyundai Elantra! Celebrating the car with my personal car price negotiator! This guy drives a hard bargain! 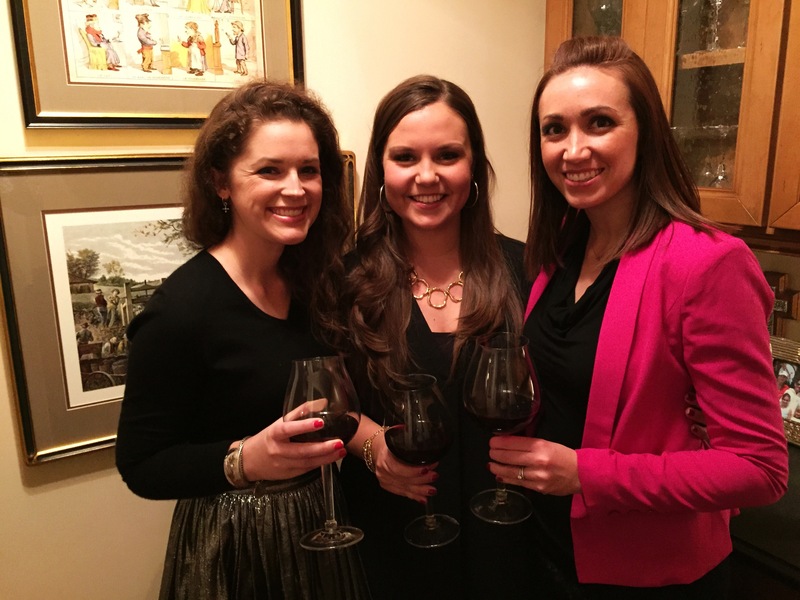 New Years Eve with good wine and great people! 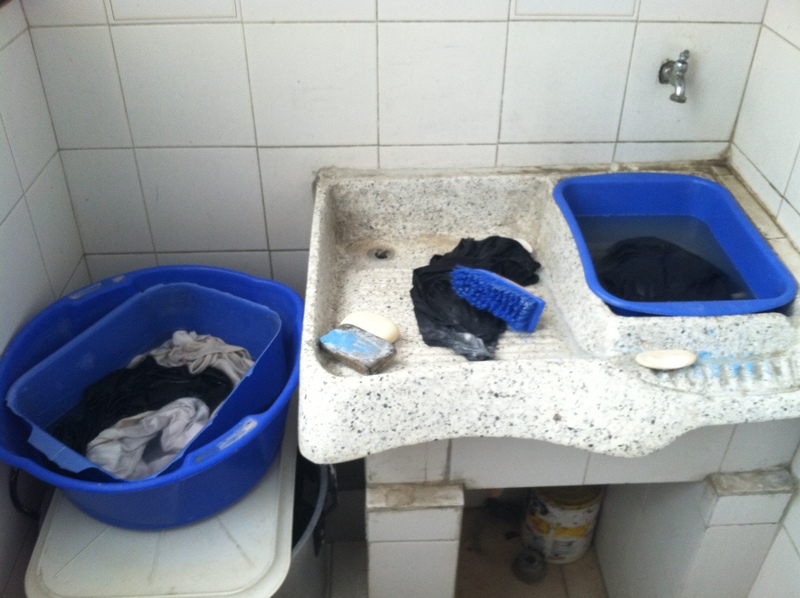 During Peace Corps training they talk a lot about something called ‘reverse culture shock’. 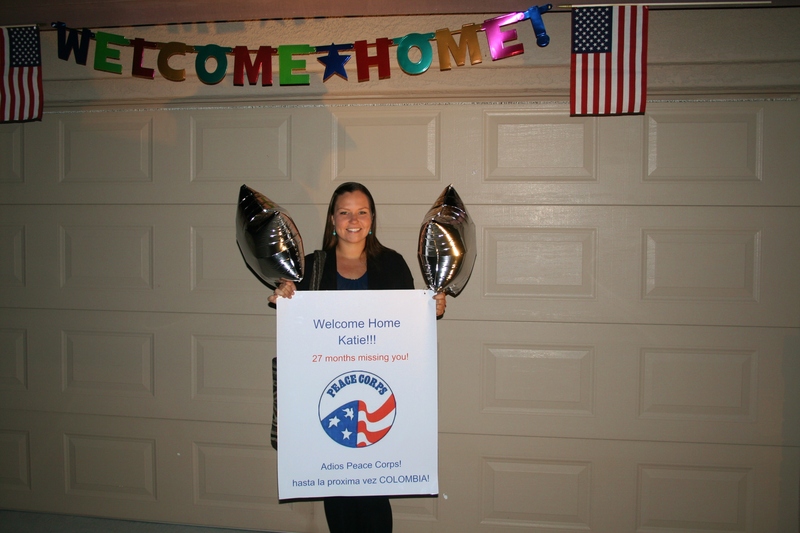 Everyone expects to experience culture shock when they move to another country, but what people often don’t think about is the reverse culture shock that can occur when a person returns to their home country after an extended period abroad. This can be different for everyone and lucky for me, I have adjusted back to life in the states relatively quickly and easily! Of course there are a few little adjustments like remembering that in the states you can throw toilet paper into the toilet, getting into the habit of saying ‘dollar’ instead of ‘mil’, having one million greek yogurt options at the grocery store, etc. Besides these small things, one of the biggest differences I notice since being home is that I have a greater appreciation for many things that I definitely took for granted before my time in Peace Corps. Whether it is the ease of doing laundry, the abundance of clean water, the safety/cleanliness of where I live, or the joy I get from spending time with friends and family….I am reminded daily of how fortunate I am and remember to be grateful for all that I have. While I am so happy to be home, I still miss Colombia and the wonderful people that became a part of my life there, but thanks to the wonders of modern technology I am able to keep in touch pretty regularly. I know that someday I will travel to Colombia to visit and I am excited for the day that I get to return to the place and people that I came to love so much. 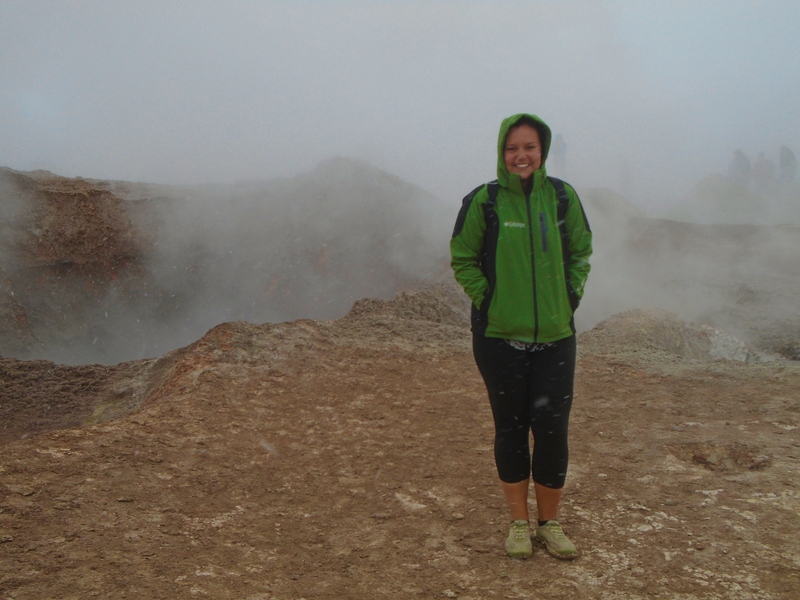 I want to keep this blog as a memoir of my time in the Peace Corps, so I will not be continuing to write here. I plan on posting one last update in the coming months, so be on the lookout for the final farewell! Until next time…..paz y amor. 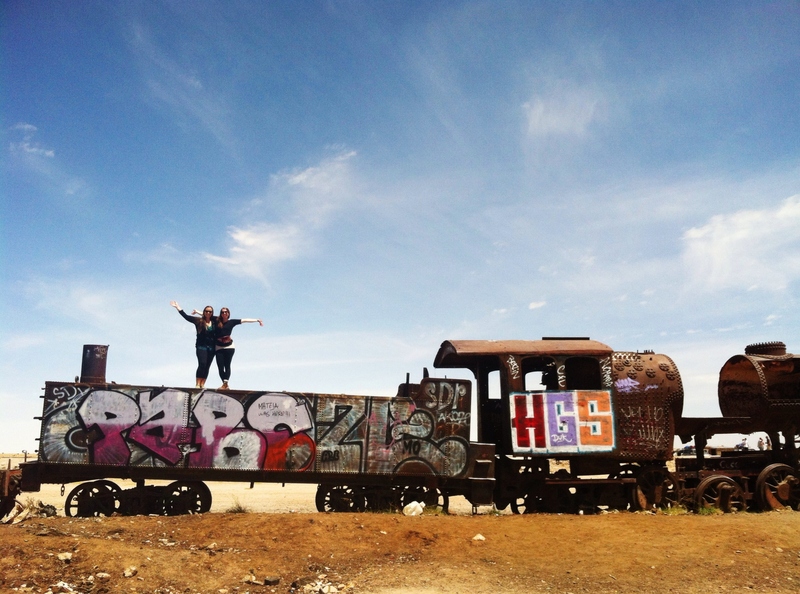 Comments Off on Life as a Returned Peace Corps Volunteer! Reunited after a whole year apart! 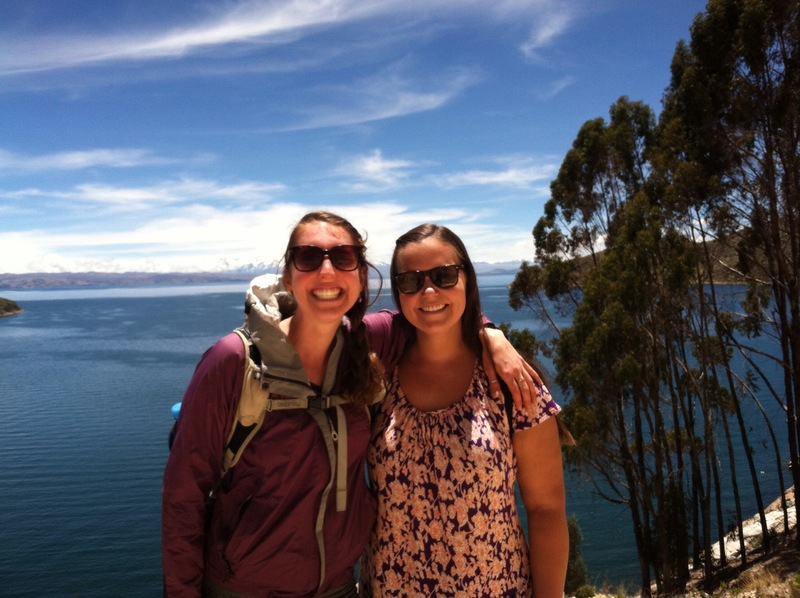 We met up in La Paz, the highest national (de facto) capital in the world at about 13,400 feet, and spent our first few days acquainting ourselves with Bolivia (and acclimatizing to the altitude!). 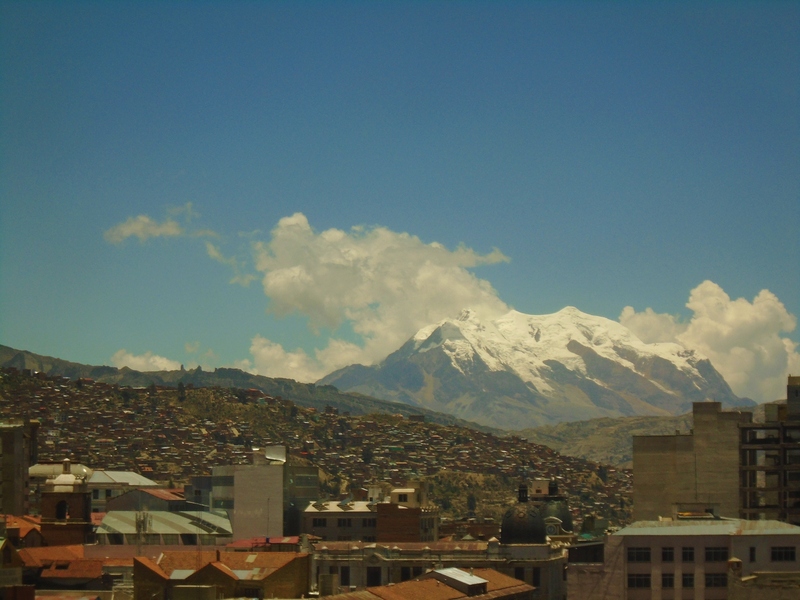 View of La Paz from the hostel! 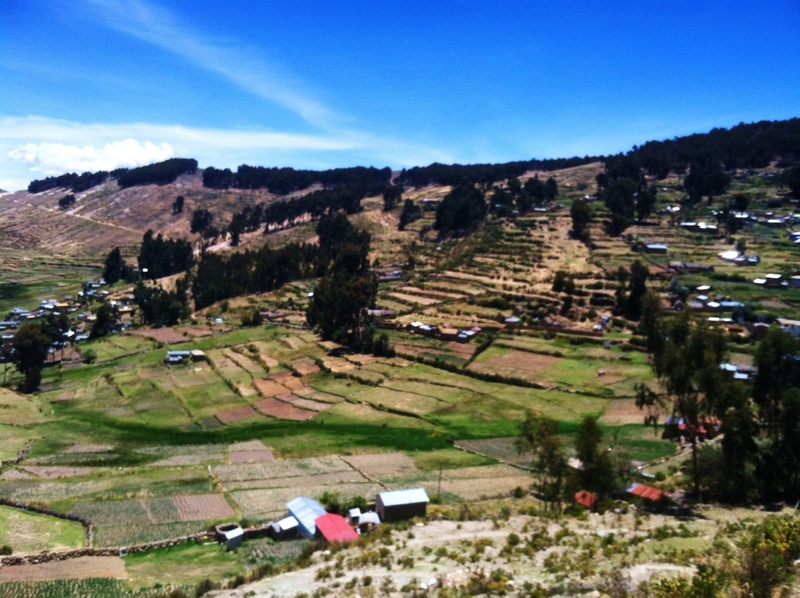 Next we hopped on a bus for the two hour ride to Copacabana, a quaint town on the shore of Lake Titicaca and the gateway to Isla del Sol, which is considered to be the spiritual center of the Andean world and the birthplace of the sun and the moon. We spent the day walking from one side of the island to the other (and getting a little bit lost, momentarily thinking we were going to die, and then being lead back to safety by a dog). In the evening we caught a boat back to Copacabana and spent the evening relaxing at our beautiful hotel looking out over the lake. 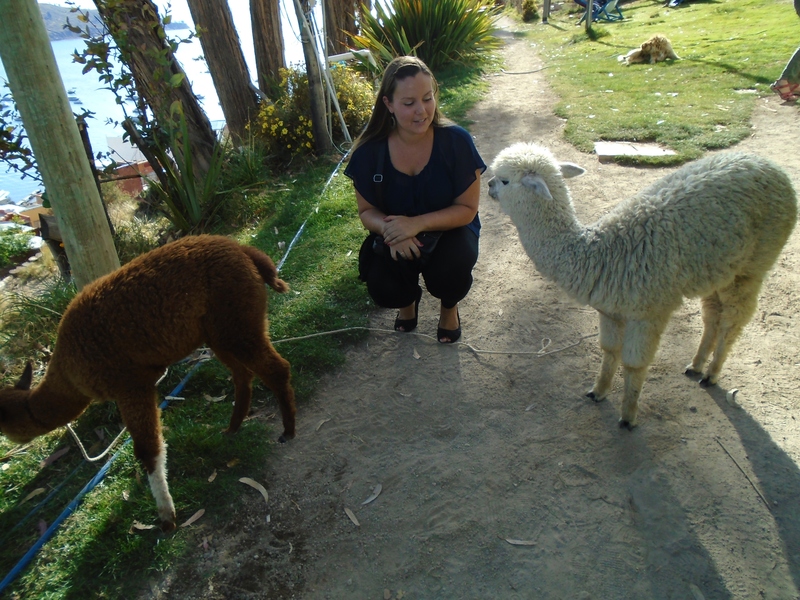 Just chatting with some llamas. 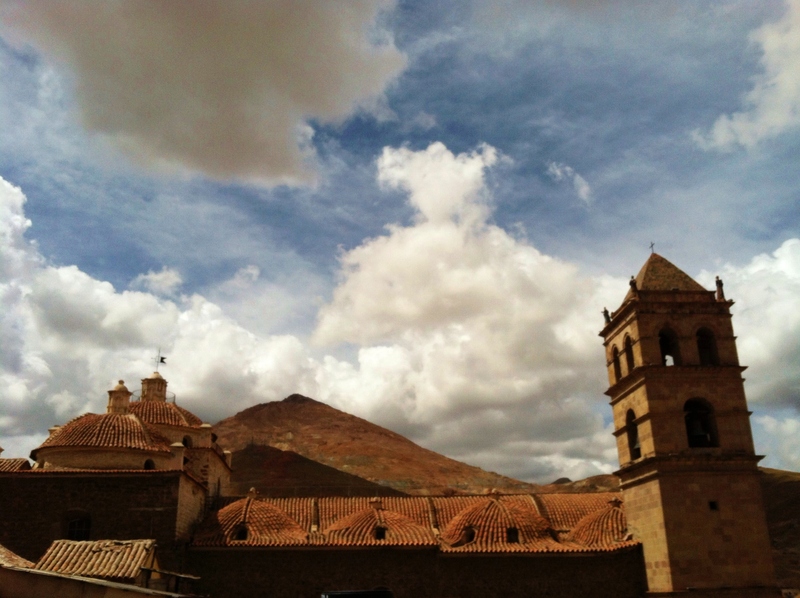 After leaving Copacabana and making a short pit stop in La Paz to regroup, we headed out for the city of Sucre. We wandered through the center of town, visited historic buildings and museums, and hiked up to the mirador. My favorite place we visited was about two hours outside of Sucre, at the Tarabuco Sunday market, where inhabitants still gather in traditional dress to exchange textiles and other products. 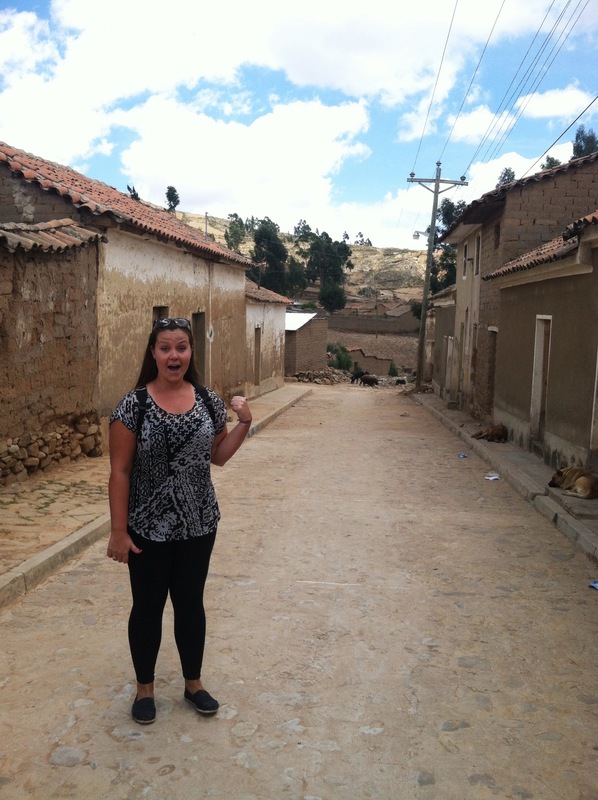 Beautiful white buildings line the streets of Sucre! 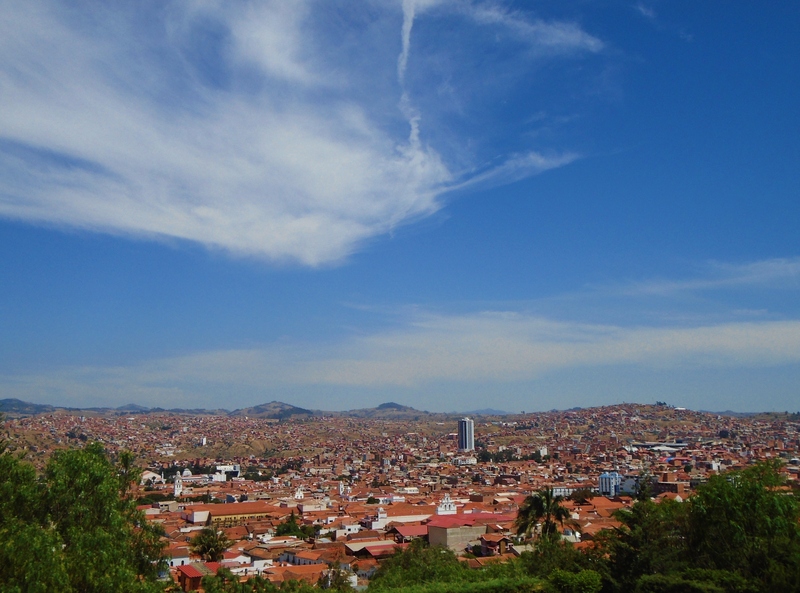 View of the city from the mirador. A family of pigs in Tarabuco! 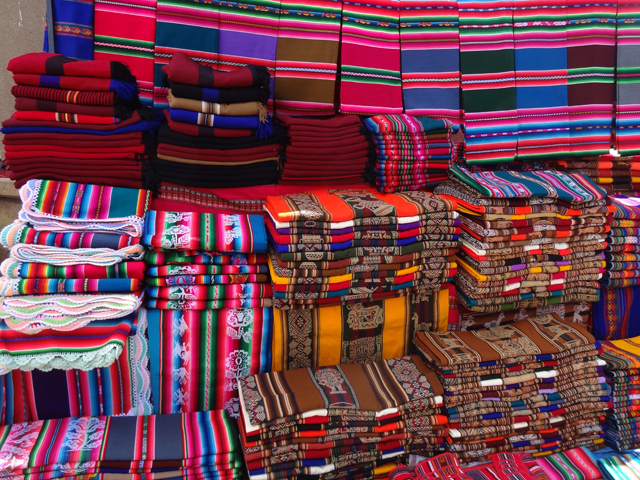 Textiles at the Tarabuco market. 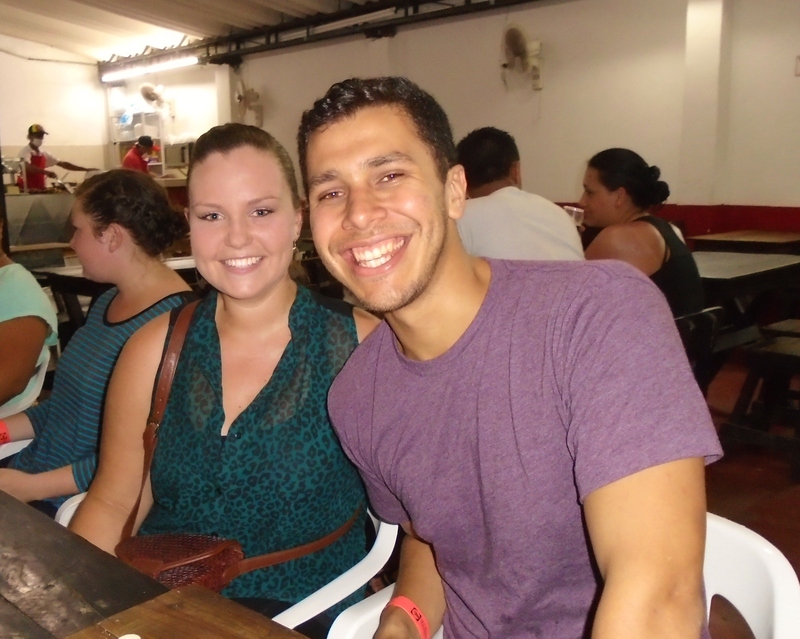 As much as I would have loved to stay in Sucre forever, we had other places to see! 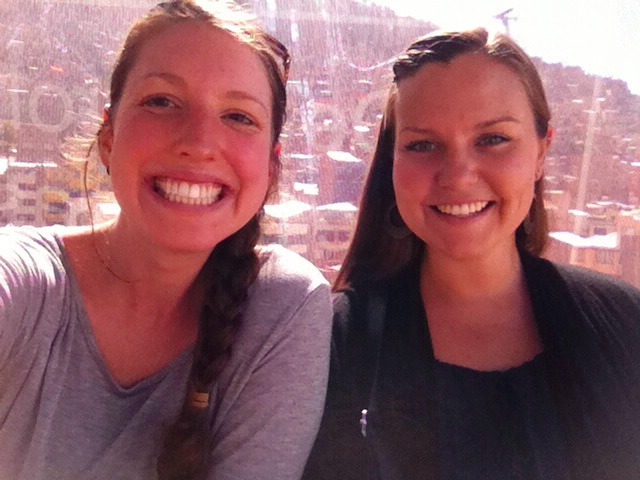 We got on a bus and rode about three hours to the town of Potosí, one of the highest cities in the world! The town sits at the foot of the Cerro Rico. 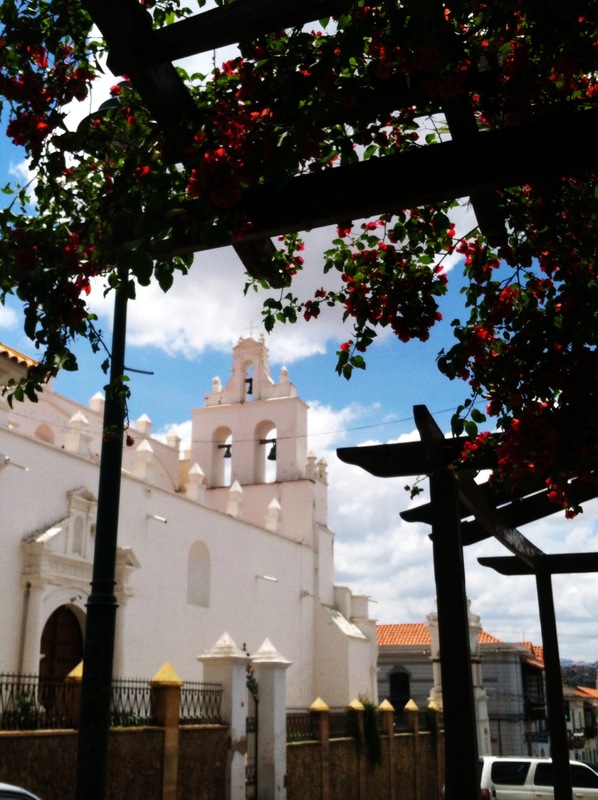 The town is on the UNESCO World Heritage List for the intricate baroque churches and monasteries found throughout the town and home to beautiful Spanish colonial architecture. Cero Rico from the rooftop terrace of the hostel. 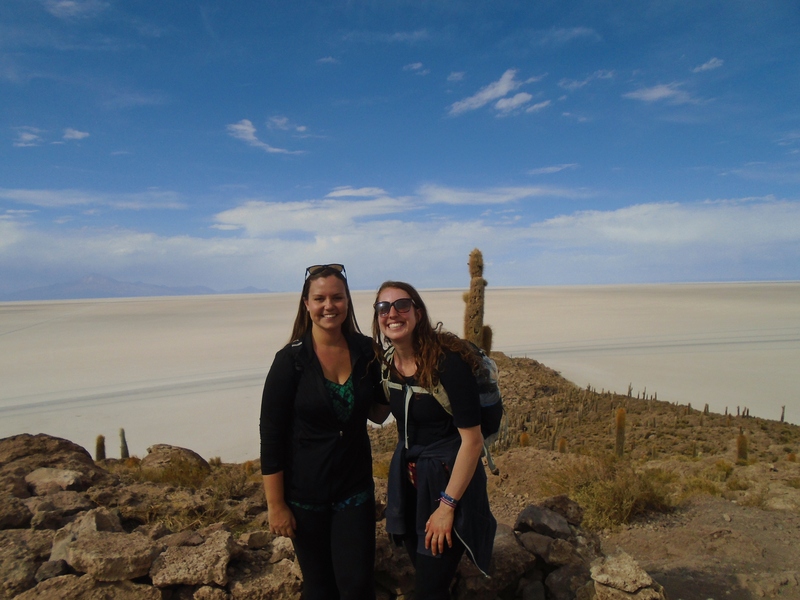 Our next stop was the town of Uyuni which we reached by yet another bus ride. 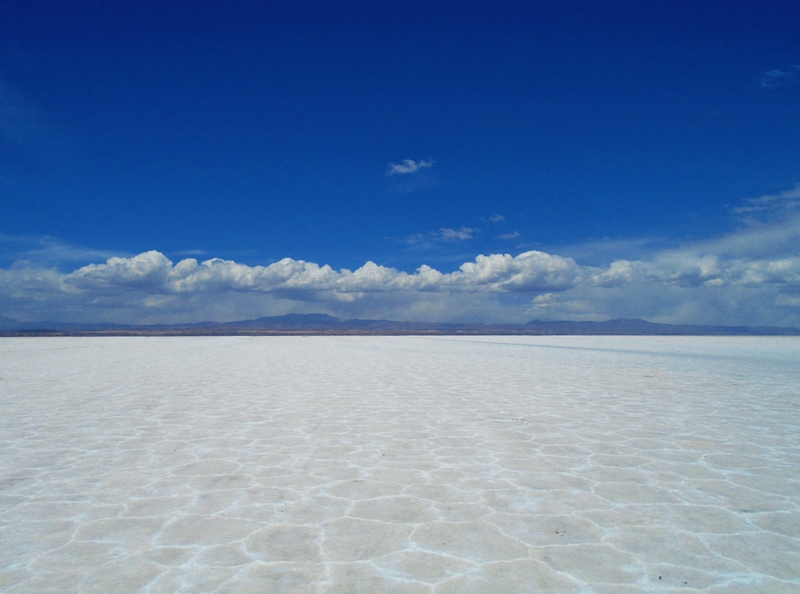 Uyuni is a very small pueblo with nothing really to see, but it is the jumping off point for the salt flat tours and has lots of tiny hostels, restaurants, and shops catering to people getting ready to head out. 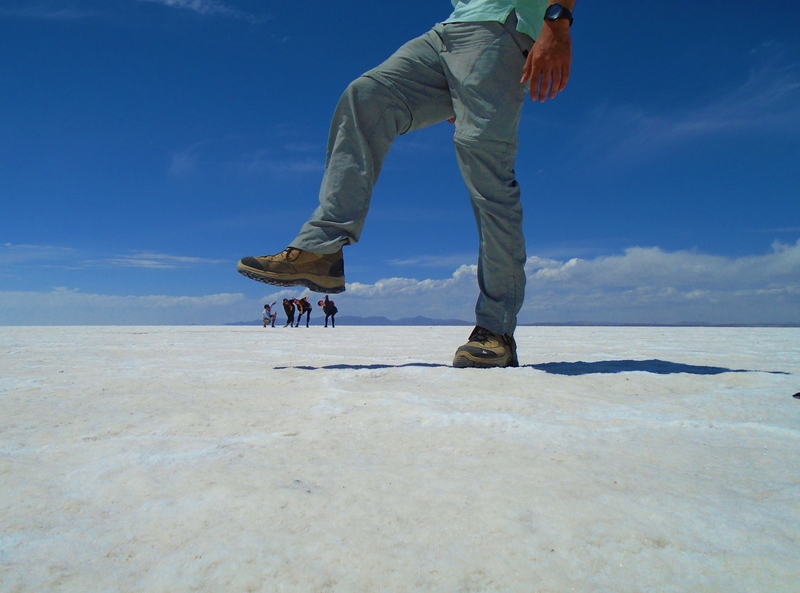 In the morning we met up with our group for a 3-day, 4×4 tour in and around Salar de Uyuni, the largest salt desert in the world. 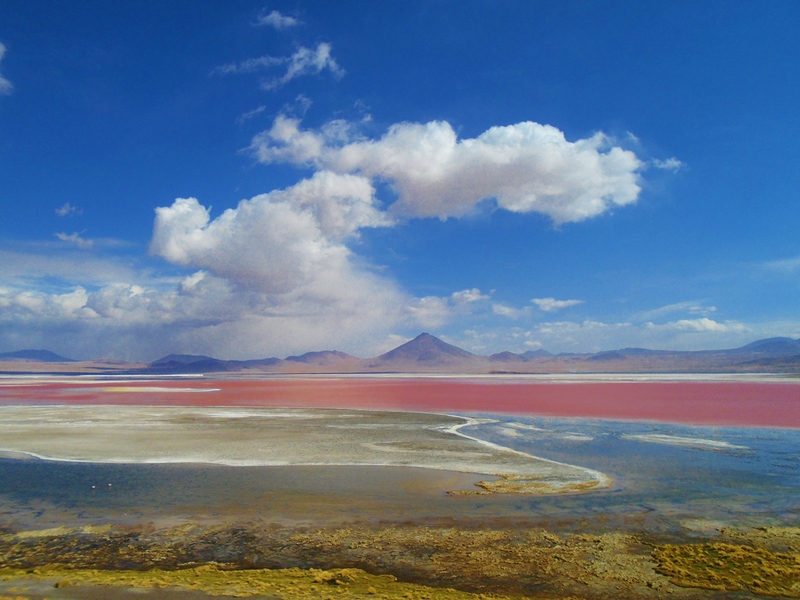 The trip was absolutely mind blowing as we crossed rugged deserts, stood in the middle of the huge expanse of salt, cut through epic volcano-lined mountain ranges and admired breathtaking multi-colored lagoons along the way. 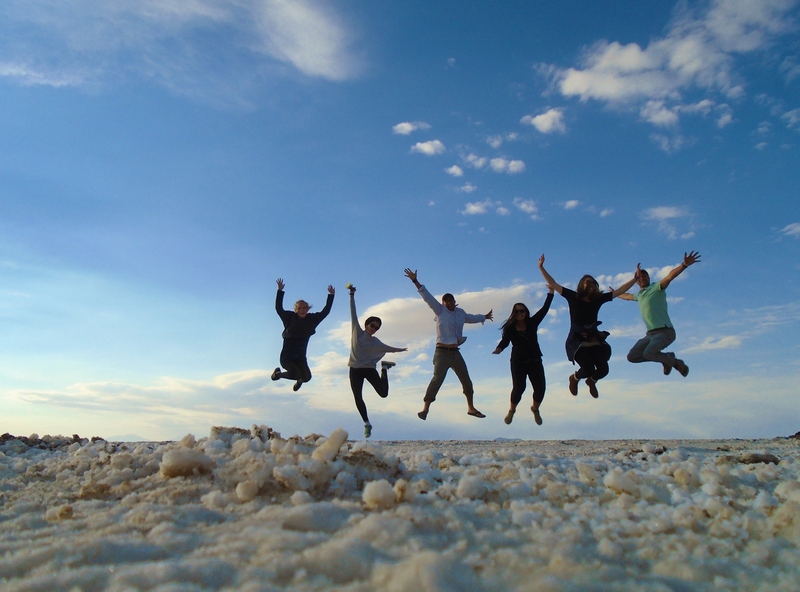 Fun on the salt flats! Cacti that reminded me of home! 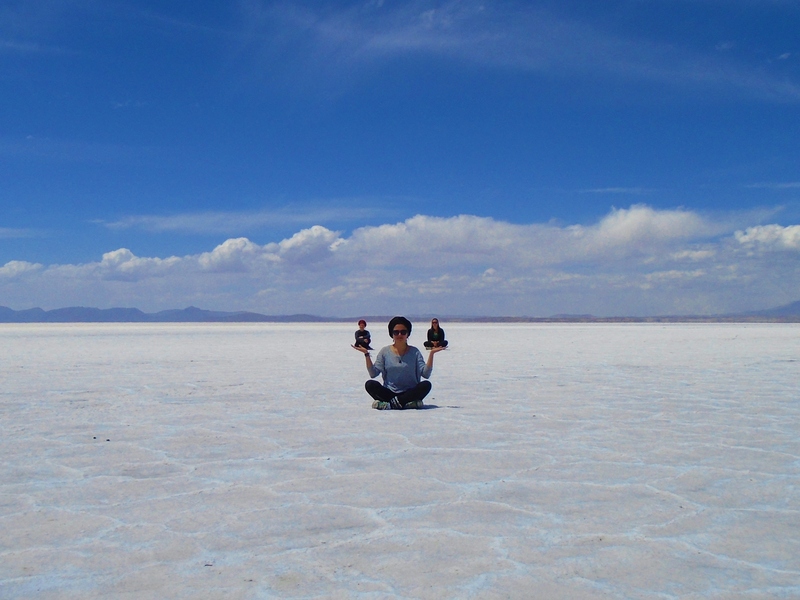 We returned to Uyuni on the third night, grabbed a bite to eat, and then caught a 12 hour overnight bus back to La Paz. 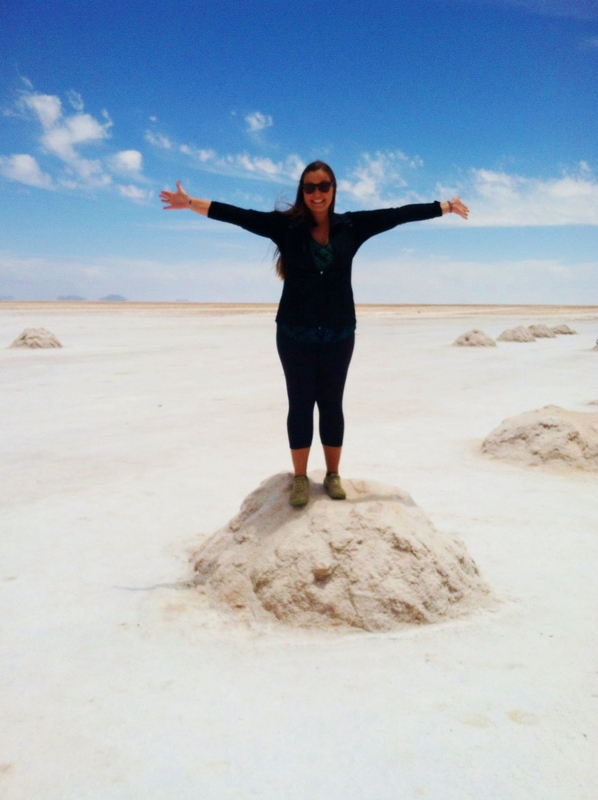 We spent our last few days in La Paz mostly just relaxing, buying llama print everything, and enjoying hot showers after getting pretty cold and dirty on the salt flats! 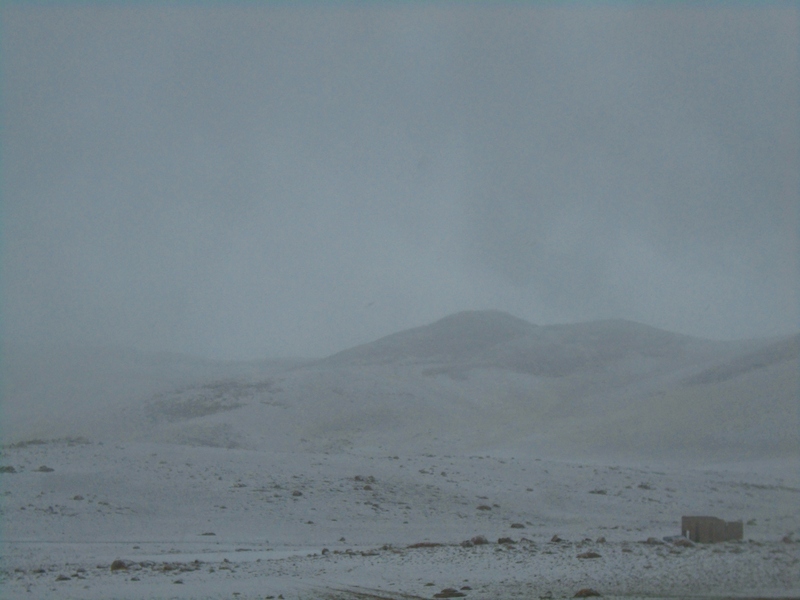 Geysers in a snow storm! 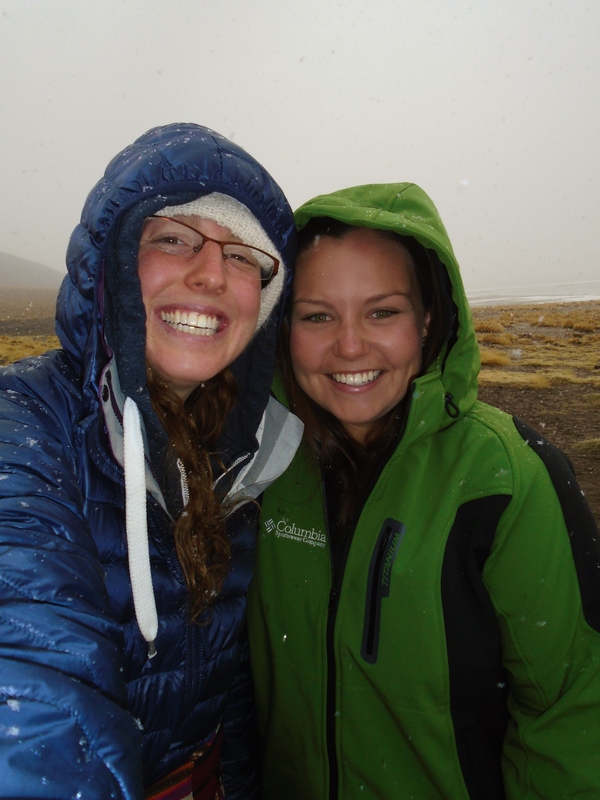 It is just a LITTLE colder here than my last two years on the Colombian coast…. This morning we left the hostel around 2:15am (yikes!) in order to get to the airport for our 4:25am flight! Ironically, one of my layovers was in Bogota, so I said goodbye to Colombia one last time with a cup of my beloved Juan Valdez coffee and parted ways with Chelsey. I have had a smooth (and LONG) day of traveling so far and I am just one more flight away from stepping foot in the UNITED STATES for the first time in over two years! 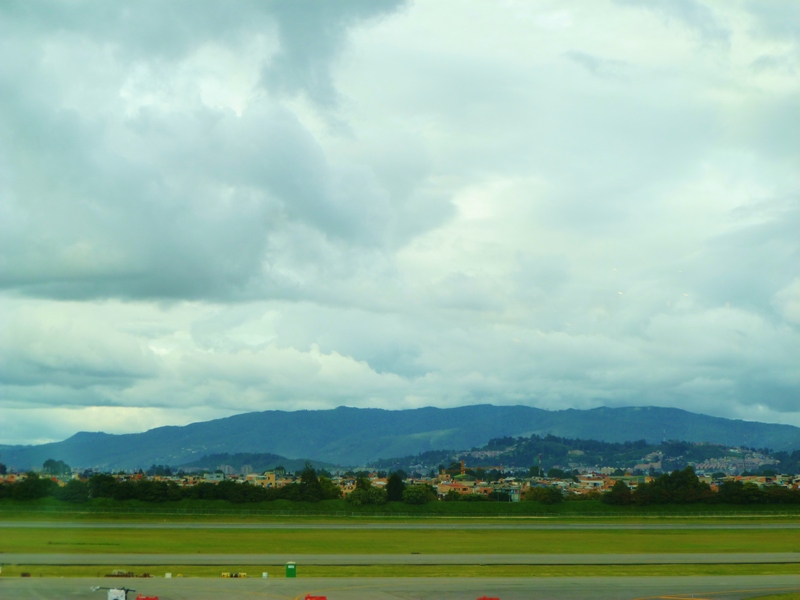 One last glimpse of Colombia from the airport! Bolivia was unlike anywhere else I have ever traveled and I was quick to fall in love with the beautiful scenery and gentle people. Although it definitely has the ‘gringo trail’ (which I stuck to pretty closely), it is much less touristy than many other places I have been. It is one of the most ‘remote’ countries in the western hemisphere and the most indigenous country in the Americas with 60% of its population being of pure Native American ancestry. It is a country that is still rough around the edges, with unparalleled geographical diversity, a vibrant culture, and fascinating people—all of which make it a unique experience for travelers. Freezing, but so happy to have been reunited! Until next time (which will be FROM THE UNITED STATES)………paz y amor. Adios South America! See you soon Arizona! 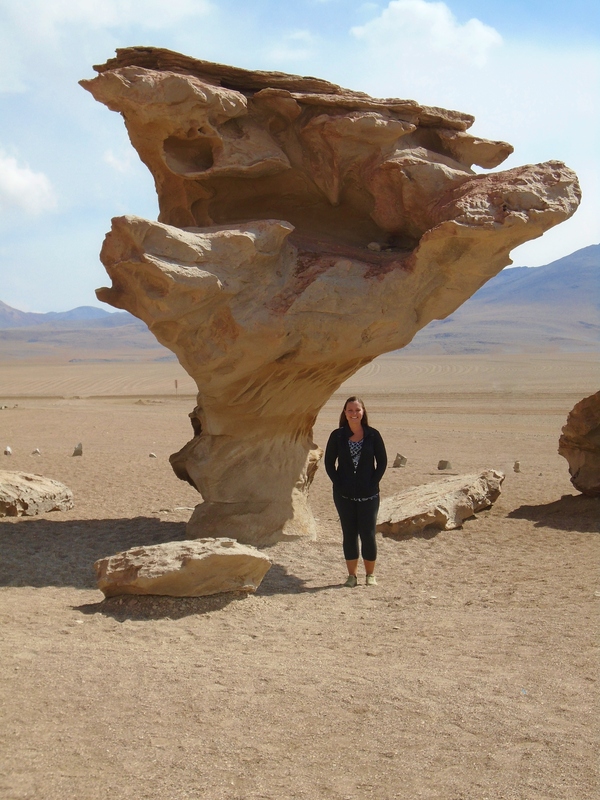 See all of the pictures from Bolivia here. 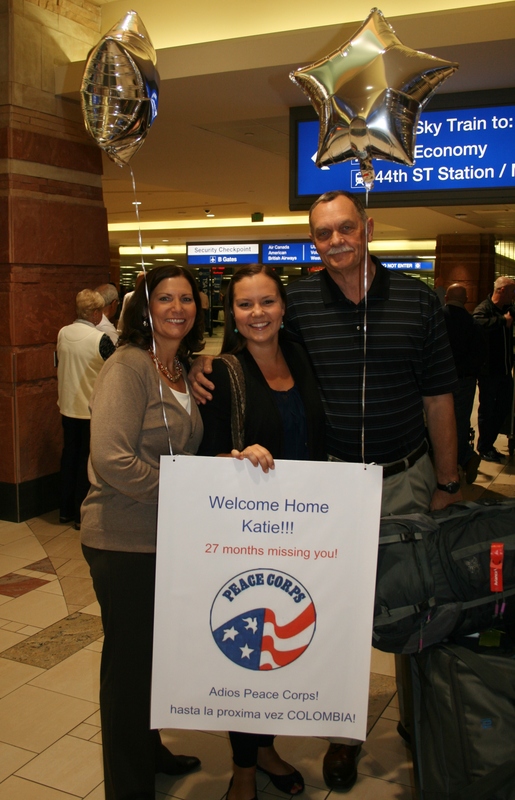 As of Friday October 31st at 4:00pm, my service has ended and I am officially a Returned Peace Corps Volunteer! 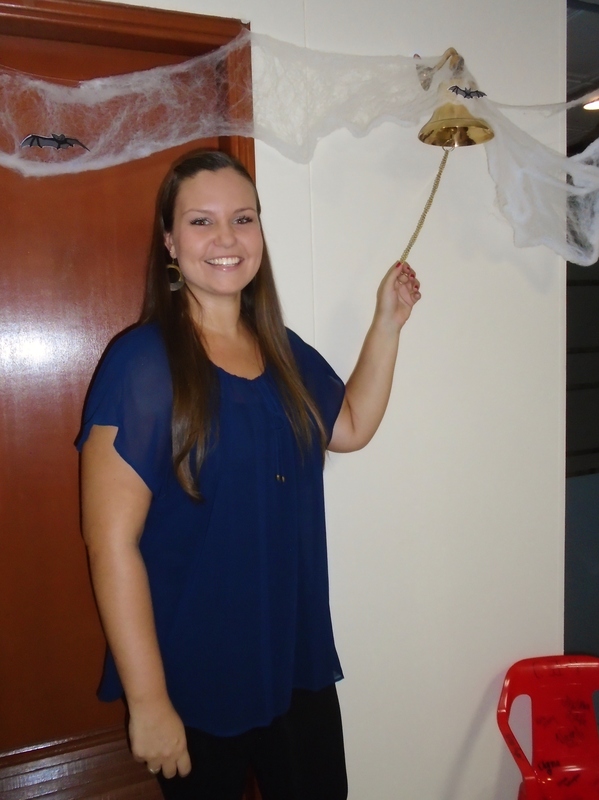 Ringing the bell symbolizing the end of my service! I spent the beginning of this week buying last minute remembrances, saying goodbyes to people around town, doing all my favorite things one last time, and packing everything I own into the two bags I came here with nearly 27 months ago. 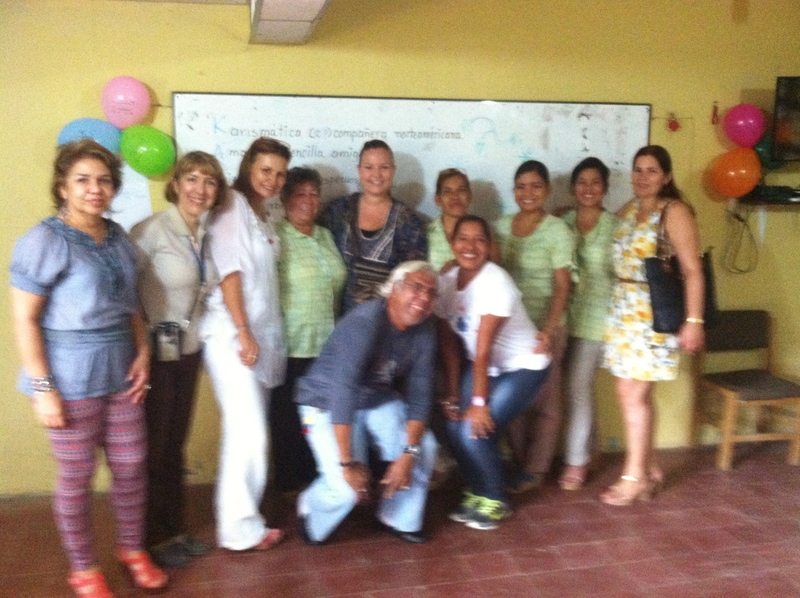 I left Santa Marta on Thursday morning to head to Barranquilla where the PC Colombia office is located. As I rode the bus over the mountain out of Santa Marta, I caught one last glimpse of the place that has been my home for the last two years. 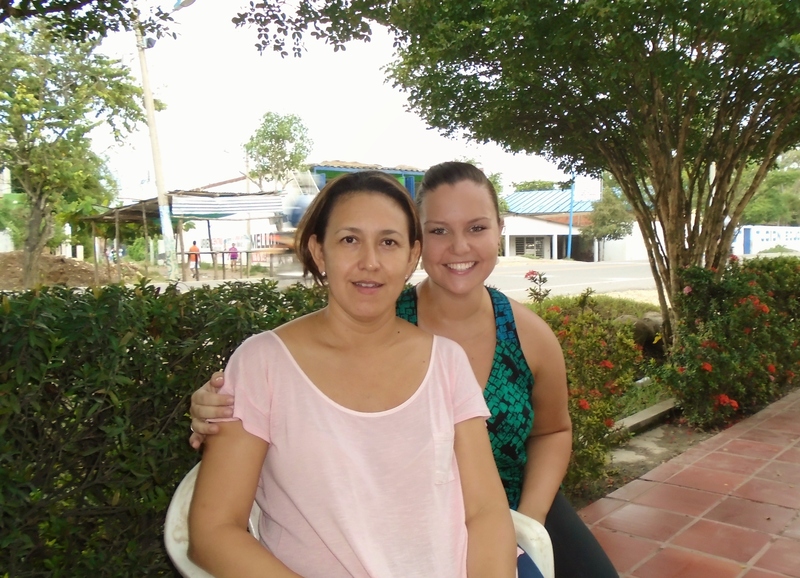 Saying goodbye is never easy, but I am comforted because I know that Santa Marta and I will meet again someday. 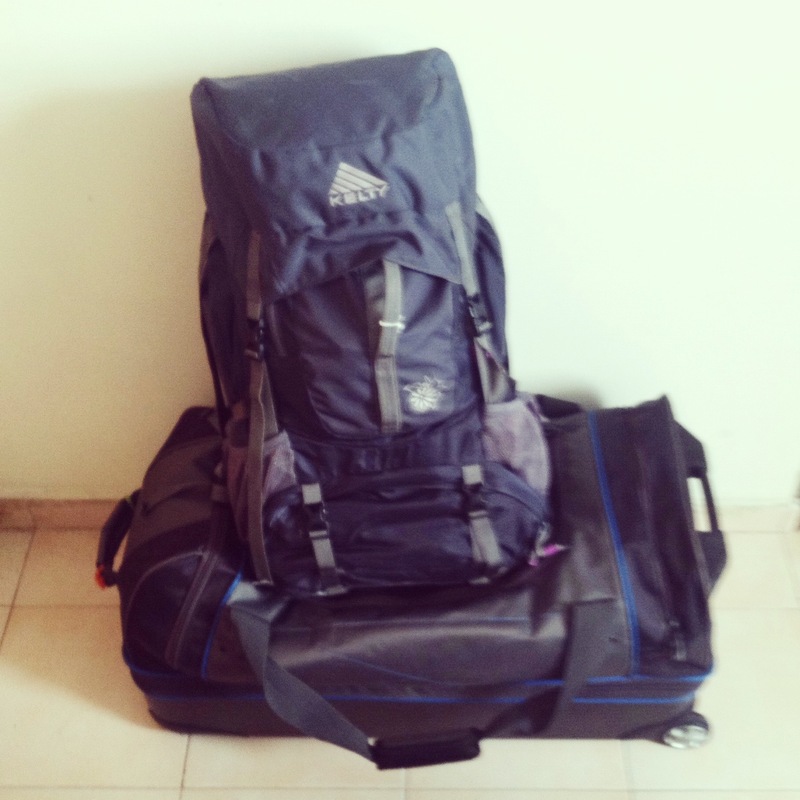 Everything that I own in two bags. My last sunset on the bahia. 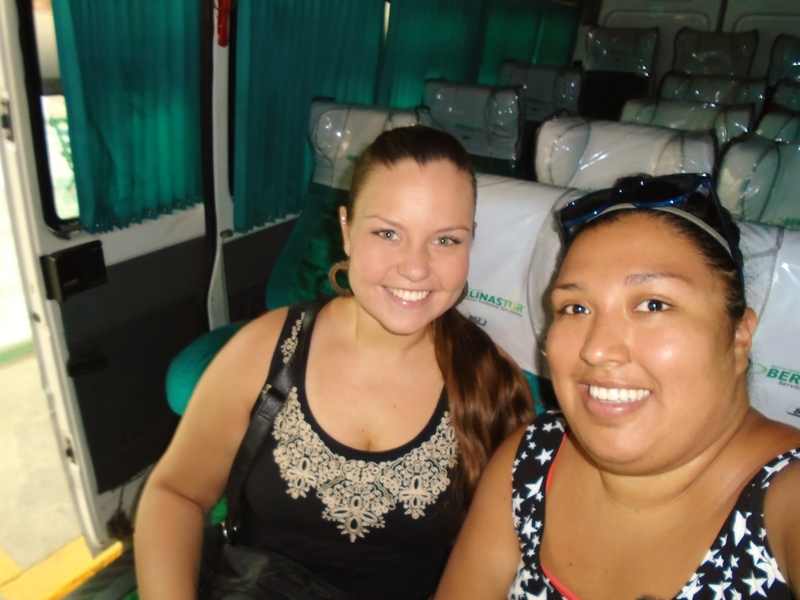 On our last bus ride from Santa Marta to Barranquilla! Thursday evening after we dropped all of our things at the hotel I got to go to my favorite restaurant for the delicious salad bar. I spent all day Friday at the office completing exit interviews and taking care of administrative tasks. 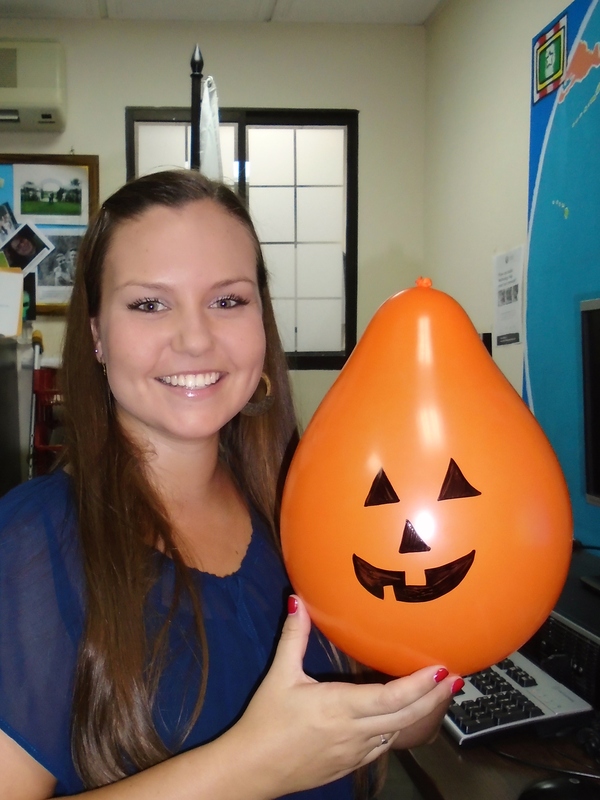 In my downtime I helped make Halloween decorations for the office Halloween party! My last C&W salad bar! Headed to the office for a long day of meetings! If you can’t carve jack-o-lanterns, draw them! On Friday at 4:00pm we gathered in the office for the Bell Ringing Ceremony, which is the official close of a volunteer’s service. 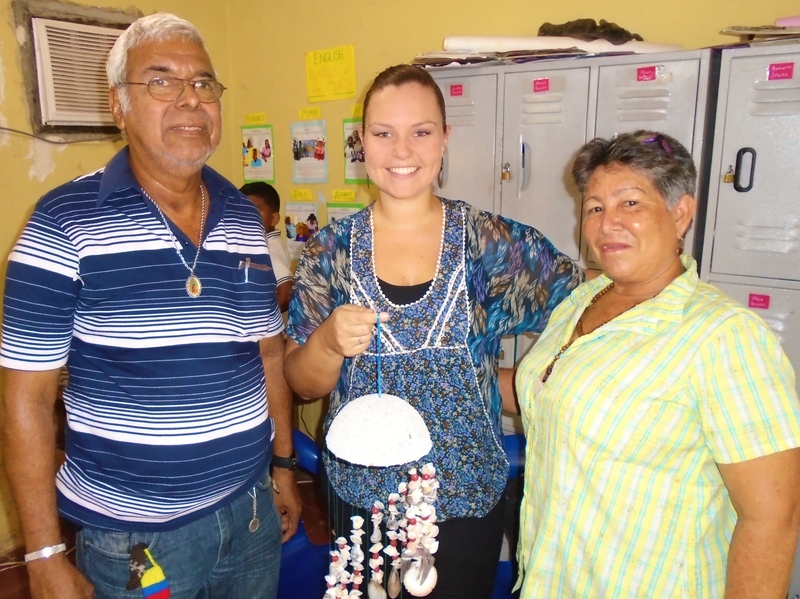 While it might seem like ringing a little bell is not that significant, for a Peace Corps Volunteer, it marks the completion of a meaningful and life changing experience. I had the pleasure of COSing with two good friends, Nina and Dianna. 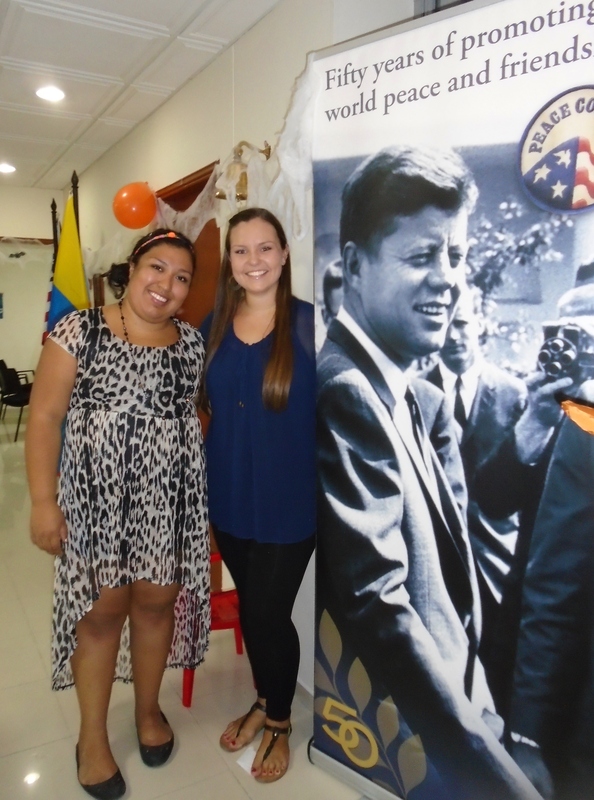 We each said a few words about our experiences (I got about a word and a half out before I started crying…) and we thanked our fellow volunteers and the Peace Corps staff for all they have done for us during the last two years. Then we each rang the bell and the rest, as they say, is history! 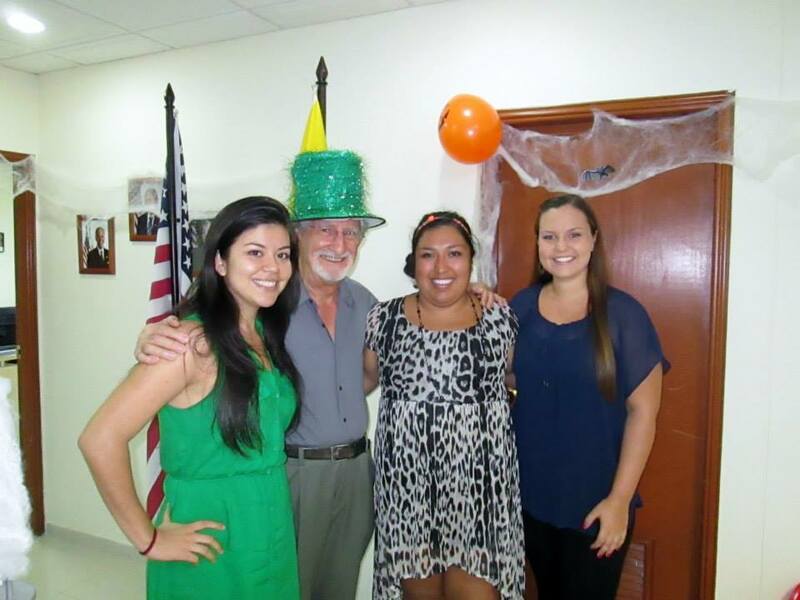 With our Country Director, George! Me, Nina, and our pal JFK! I miss these ladies already! 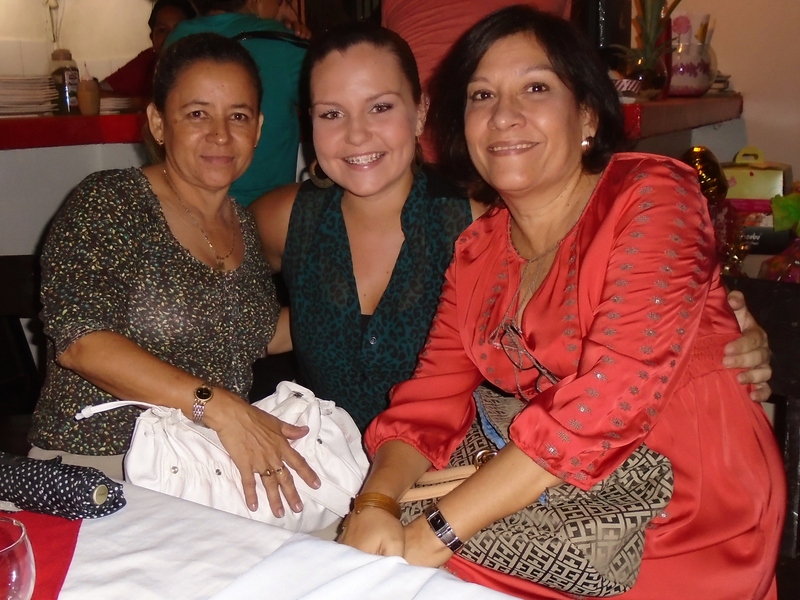 I spent the weekend cramming in all of my ‘lasts’ around Barranquilla. This morning, I woke up at the crack of dawn to say goodbye to Nina when she left for the airport to head home. I couldn’t get back to sleep so I grabbed some coffee and sat out on the patio to watch the city wake up one last time. A few hours ago I said chao to the Hotel Caribe staff and loaded my bags into a taxi. I enjoyed the long drive through Barranquilla on the way to the airport. The driver was an older costeño man with laugh lines deeply etched into his face, evidence of a life full of alegria here in Colombia. 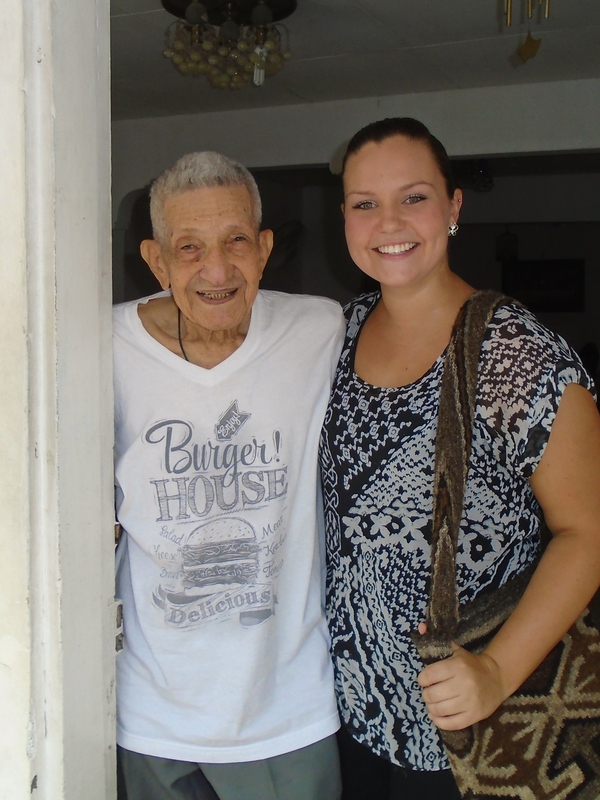 We chatted about his family, my time in Colombia, and sang along to Diomedes together. 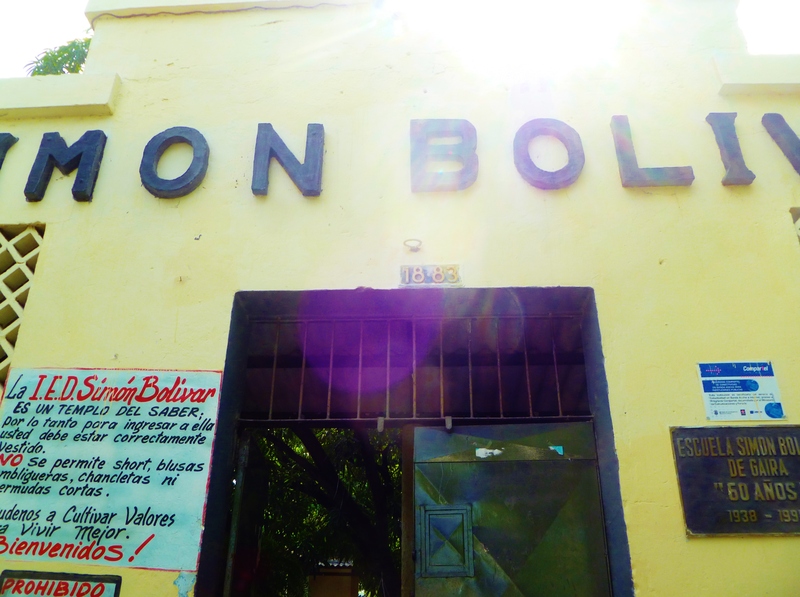 I watched the burros pulling their carts, listened to the fruit vendors shouting their offerings in the monotone voice I have come to love, smiled at the students running by in their uniforms, and gazed at all the places that were once so foreign, but are now so familiar. I have all of the expected emotions. Sadness for what I am leaving behind, excitement for what’s waiting at home, disappointment in what I never managed to do, and pride in all that I accomplished. American by birth, Colombiana de corazón. For now, it is time for me to board my plane, say goodbye to Peace Corps and Colombia, and head on to whatever adventure life brings me next. Until next time……..paz y amor. To see more pictures click here! 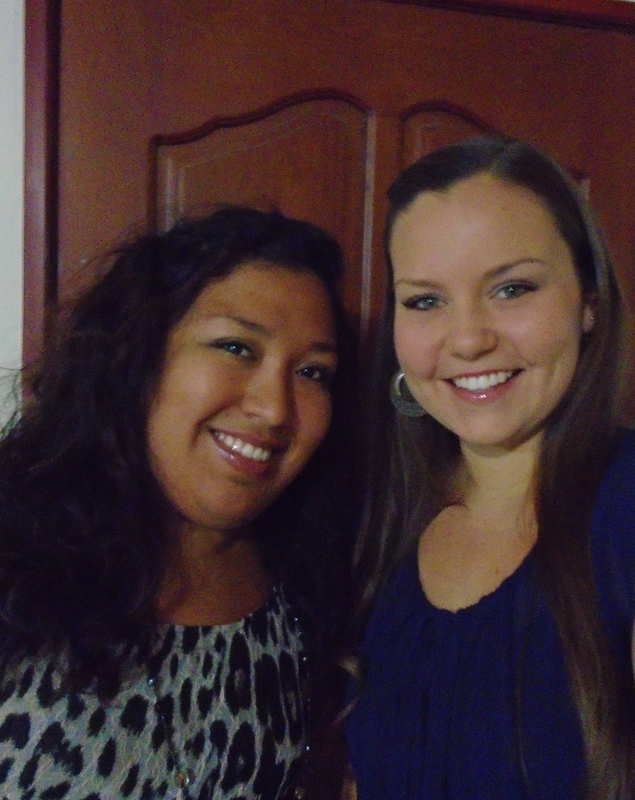 My time here in Colombia is quickly coming to a close, and lately I have been busier than ever! Here is the latest and greatest from the happiest country in the world! 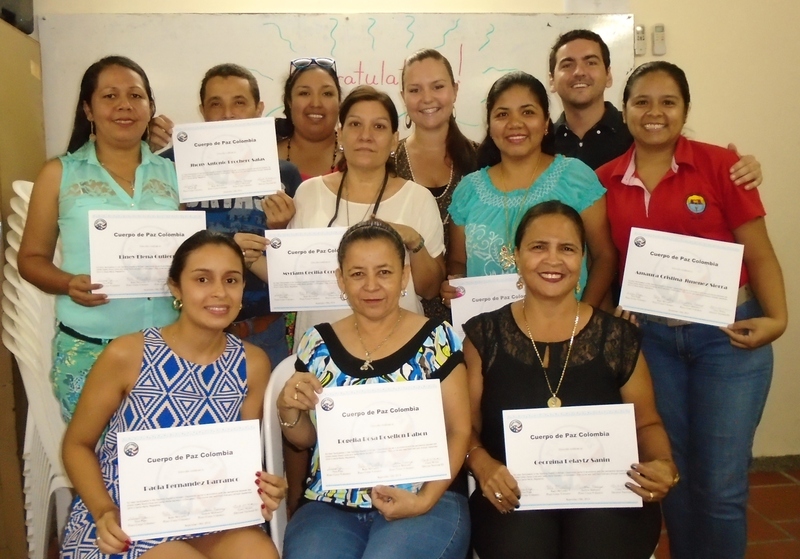 For the last two years I have worked with fellow volunteers to hold weekly night classes for public school teachers from across Santa Marta. It has been a very rewarding project and so fun to see these teachers enthusiastic about bringing these new methodologies into their classrooms. 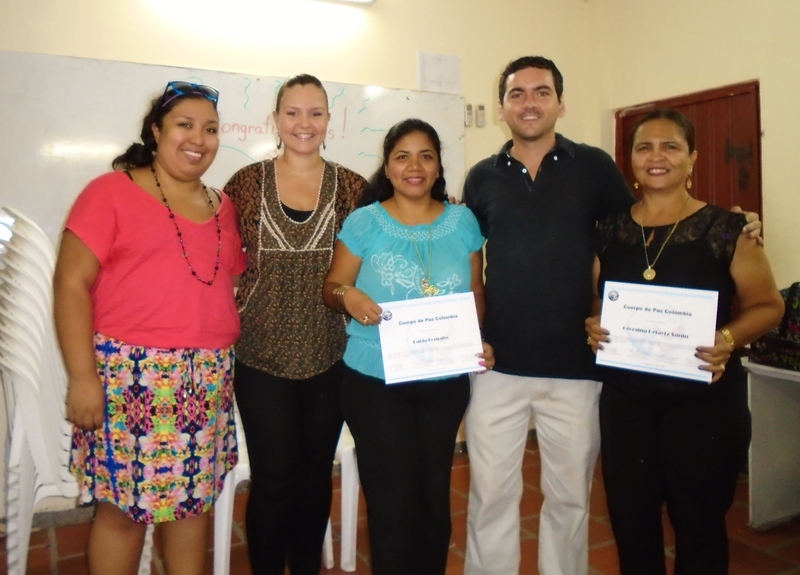 We held our final class and presented the teachers who attended the majority of the classes throughout the year with certificates. They insisted on taking us out for a nice dinner to say thank you, and it was delicious! Some of our most consistent students! I attended my last Women and Gender in Development committee meeting. Although I never managed to get a girls group started at my school due to a lack of interest from counterparts, I was able to use a lot of the materials we complied in this committee to hold workshops for girls and young women at my school and in the community. 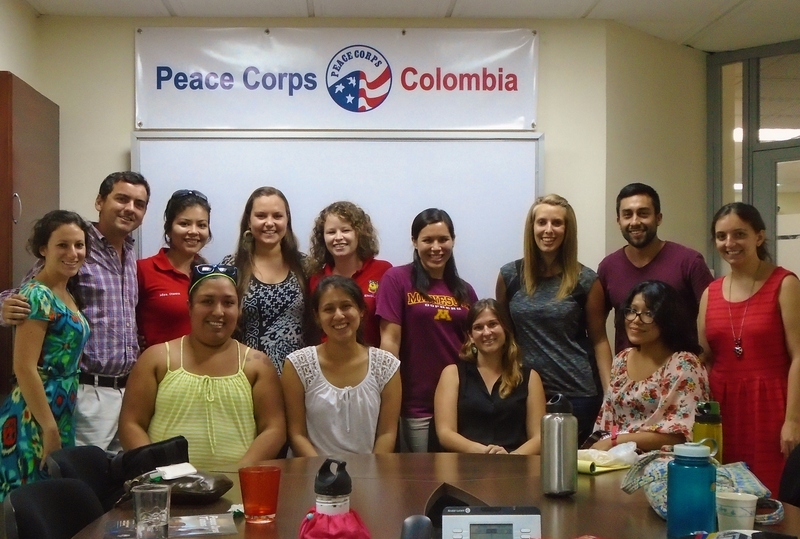 This is an amazing group of volunteers and I am excited to see future projects from PC Colombia! 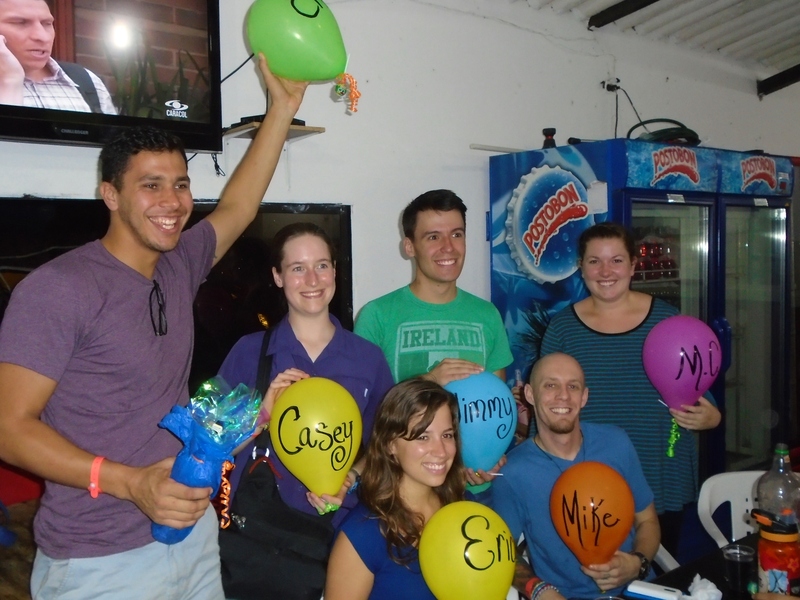 A new group of volunteers (CII6) arrived in August and have been in Barranquilla completing their pre-service training. Last Friday I found out who will be replacing me at my school! His name is Erick and I am already positive that he is a perfect fit for Simon Bolivar. 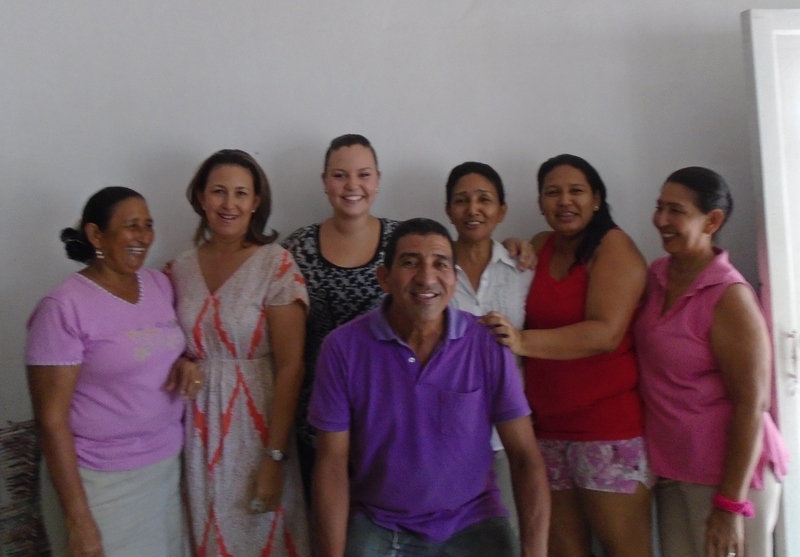 The new Santa Marta group came to visit for a couple days this week. 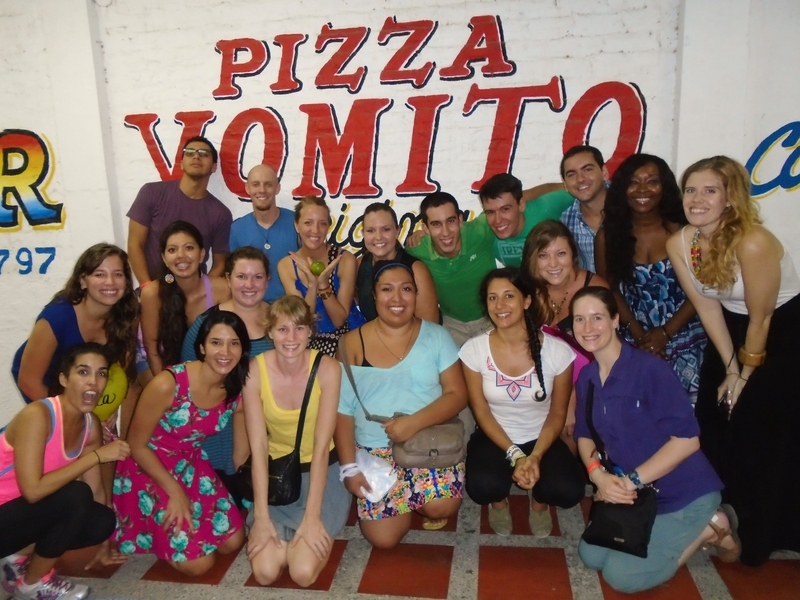 We all went out to a welcome dinner last night at Pizza Vomito (yep, your high school Spanish is not failing you, it’s actually called ‘vomit pizza’). 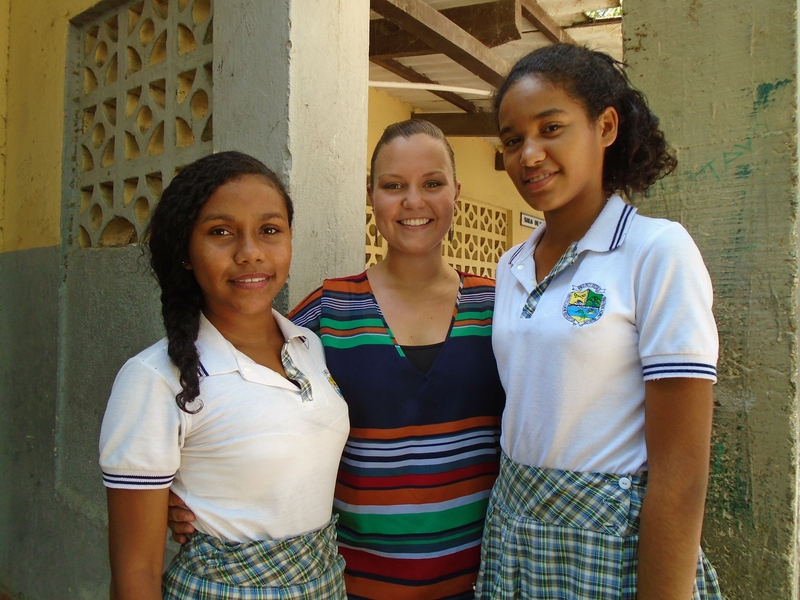 Today and tomorrow the new volunteers are visiting their schools to meet everyone and observe some classes. 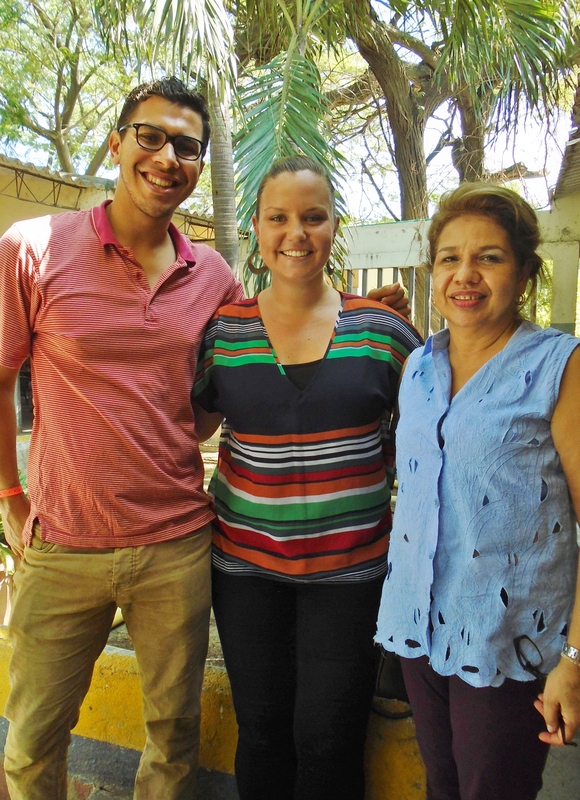 Erick hit it off with the teachers and kids right away today and everyone is so excited to start working with him! As sad as I am to leave my school, I am so happy to know that I am leaving it in such capable hands! 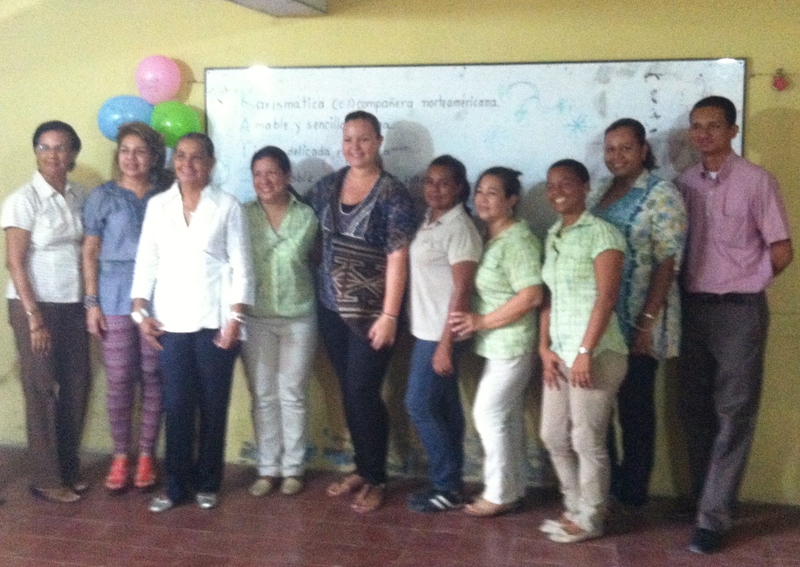 Welcoming the new group of Santa Marta volunteers! Me and Erick (the new volunteer at my school) at dinner. 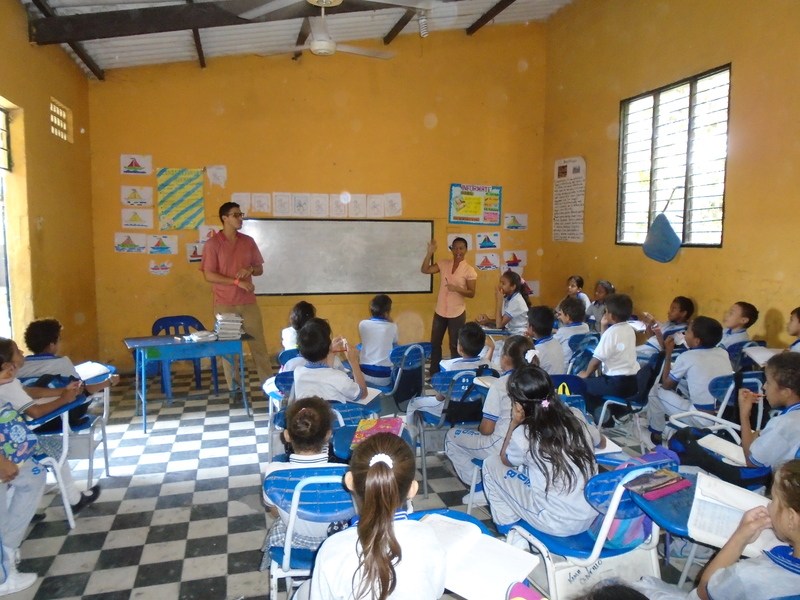 Erick introducing himself in Betzaida’s classroom on our tour of the school! Me, Erick, and our wonderful counterpart Raquel! My last day of school is this Friday and then I will have a few days to pack and do all my favorite things a few more times! 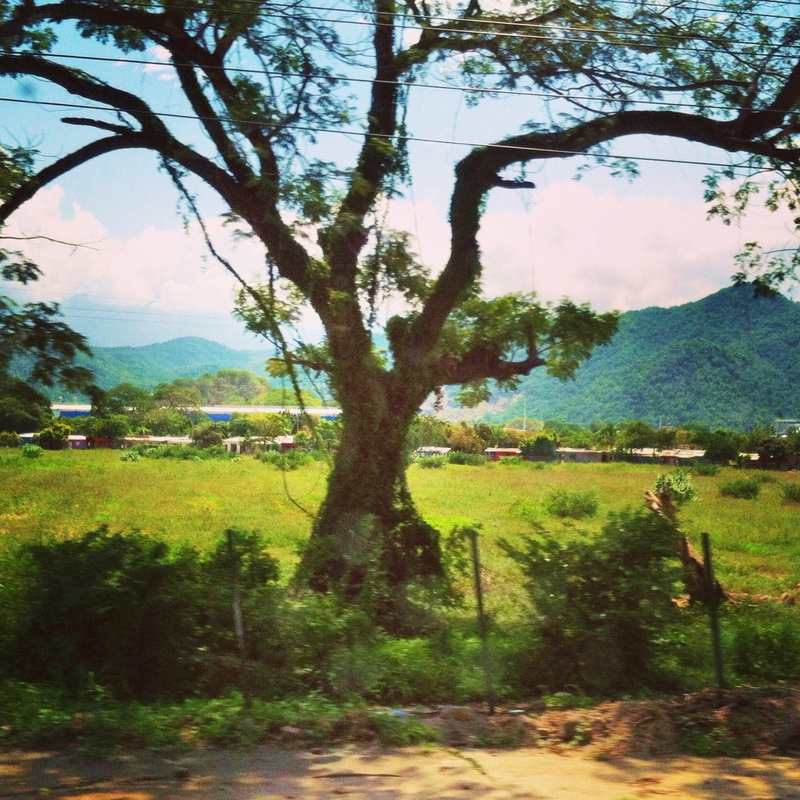 I can’t believe I am saying this but…less than 2 weeks left in Colombia! Until next time…….paz y amor. Having to change sites and leaving Bayunca was hands down the most difficult part of my service, but despite how hard it was to leave, I am still grateful to have had the experience. If you missed my site change way back when, you can read about it here. This week is Semana Uribe which means a week with no school. I decided to make the trip out to Bayunca to see my family one last time before I leave. I packed up a big suitcase with all of the clothes and things I am not bringing home with me and took it to leave with my family. Whatever they can’t use, they will bring to the church and give away. When I arrived it happened to be absolutely POURING rain and unfortunately there is a fair amount of dirt/mud between where I get off the bus and the house! Luckily, I had help because of course everyone was standing in the window waiting for me to get there and all came running out to help! We sat and talked for awhile and then headed out and walked around the pueblo yelling ‘adios‘ to everyone as we passed and catching up with people. Then we had dinner (beef, plantains, rice, and juice…my favorite!). The next day I spent the whole day hanging around the house as people who had heard I was in town stopped by to visit. My tia Heidy made some delicious arroz con leche for dinner and then we had a massive sleepover on the floor in the bedroom. 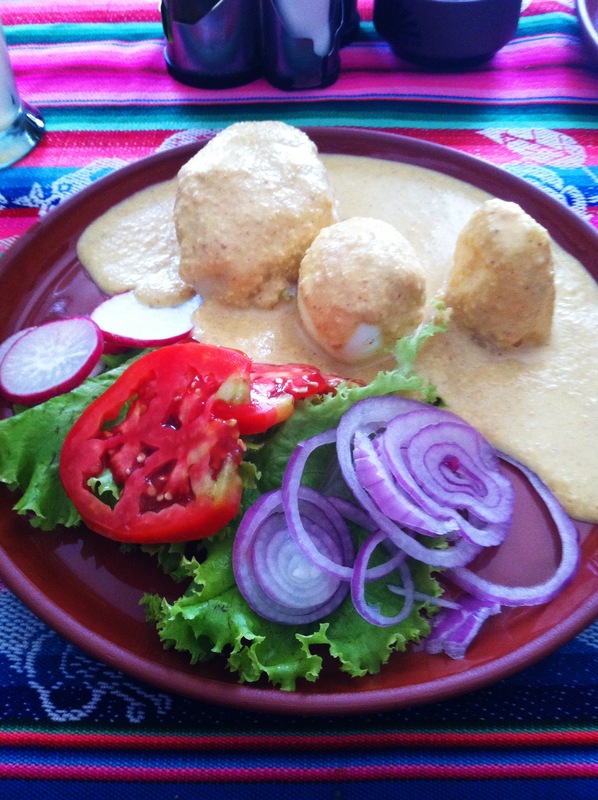 On the last day we had huevos pericos and bollo (my favorite breakfast) and then everyone went through the suitcase of clothes I bought and did a fashion show to decide who would keep what. They all gave me little recuerdos like jewelry, make up, and candies. One of the projects I was working on while I lived in Bayunca was a project with children who have various special needs. 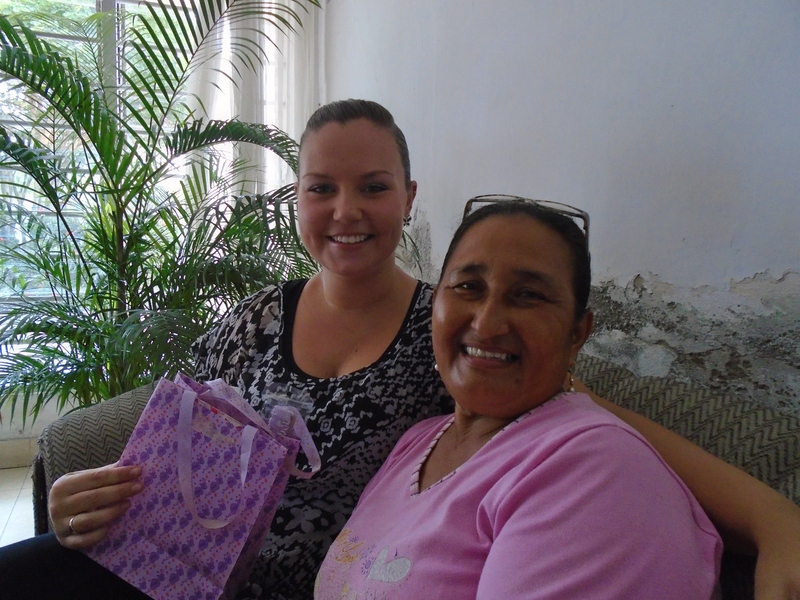 My tia Heidy has continued the project and taken it further than I ever though possible. She has turned it into a foundation and while I was in Bayunca we went over what has been done and made some plans for the next steps. She gave me a polo with the foundation’s logo and asked me to be an honorary founder so that I will be contacted and included in the future of the foundation. It made me so happy to see that while I had very little time to get things going in Bayunca, some things were able to continue and grown in my absence. Approximately 3 gallons of the world’s most delicious arroz con leche. It was really great to spend time with everyone and the relationship I have with them is so special to me. Although I only lived there for five months and have been away three times that long, it still felt like going home. It was a whirlwind few days filled with so many family members I can’t even remember who I saw, lots of celebrating, holding all of the babies that have been born since I left, so much food I thought I might die, plenty of sitting around in plastic chairs, and many very heartfelt goodbyes. With my favorite boys..Juan Manuel and Elias David. I couldn’t believe how much they’ve grown! The ladies and Tio Numa! 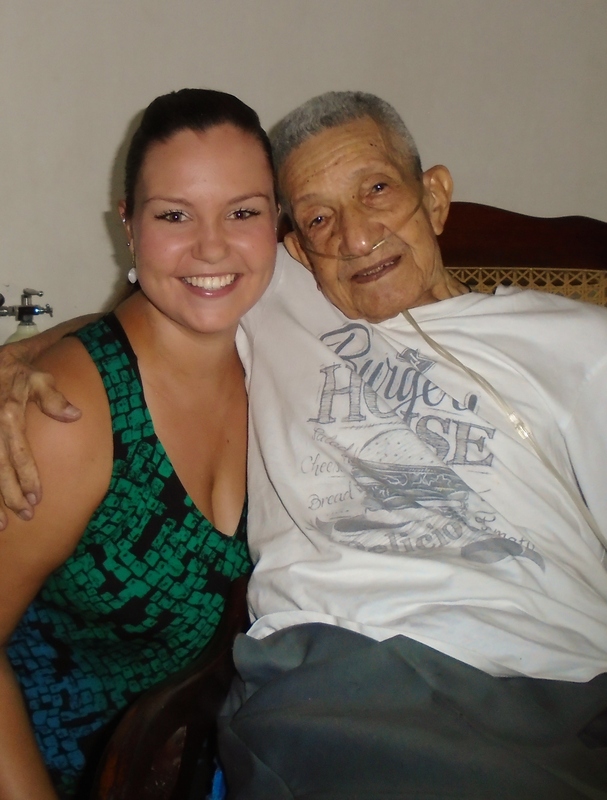 One of the reasons I was hesitant to go visit was because I am especially close with my 95 year old abuelo, Alfredo, and I was worried it would be too difficult for me to say goodbye. 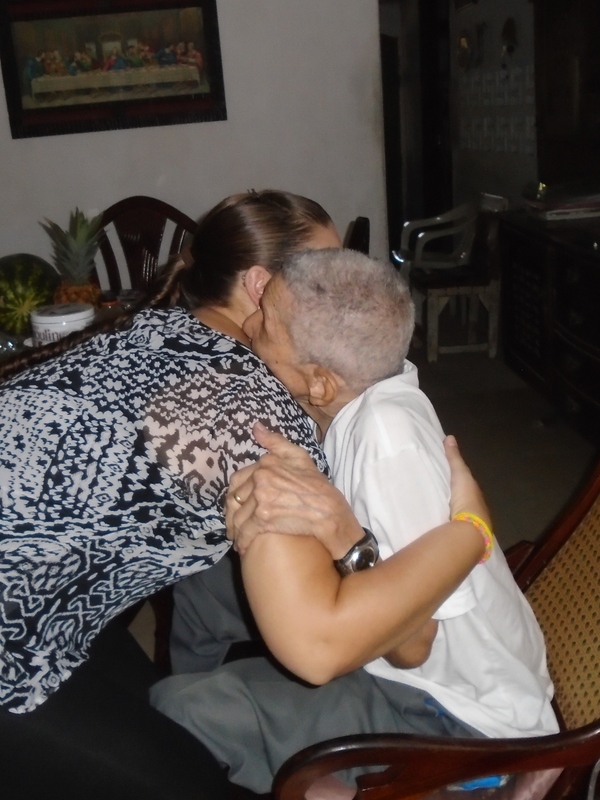 On the last morning when it came time for me to leave my abuelo grasped my hands and told me, “Please do not cry. This might be the last time we see each other here on Earth, but we will be reunited one day in Heaven where you will finally get to meet my beautiful wife.” He went on to tell me, “I hope that God blesses you in all that you do, and know that I will be with you when you get married, have children, and all the other happy moments in your life.” He then handed me a rosary which I have never seen him without, that belonged to his wife, Bienvenida. I told him I couldn’t possibly accept the rosary because I know how much it means to him. He told me it is his most prized possession, which is why he wants me to have it, and hopes that it will remind me of him and my time in Bayunca. Upon which I promptly burst into tears. And when I say burst into tears, I don’t mean a few tears slid down my cheek, I mean I BURST into tears. I said goodbye to each family member and thanked them again for all that they have done for me. There was a huge crowd of people gathered in front of the house saying goodbye. It was an overwhelming blur of hugs, kisses, prayers, tears, and smiles. They filled my backpack up with bananas and then walked me out to the bus. I waved out the window and watched them shrinking into the distance as a bus full of concerned Colombians stared at the sobbing gringa. Telling me that it’s not goodbye, it’s see you soon. This family opened their arms to me when I was a complete stranger and treated me as one of their own. I can share all of my pictures and stories, but I will never be able to convey just how much these people mean to me. They don’t just feel like family, they are family. 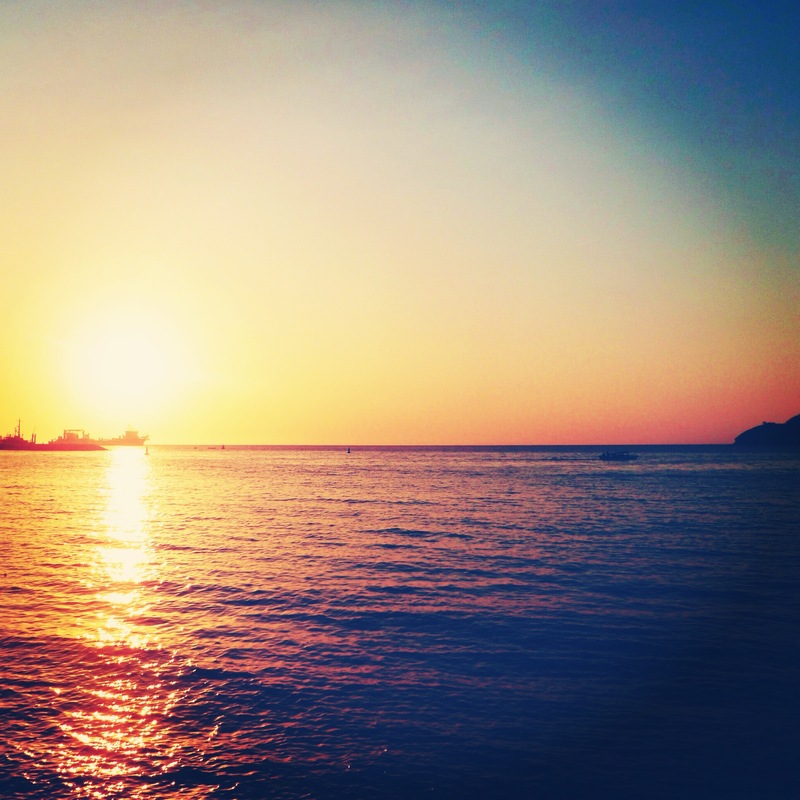 I left a part of my heart in Bayunca and I know that I will be back someday. Now that it is over, I am so happy I made the decision to go because my heart is absolutely bursting with love. Anyone who has ever lived abroad or even been on an extended vacation knows that there are comforts from home that you just inexplicably miss when you are away. The list below is mostly made up of very trivial things that are not difficult to live without, but rather they are small things you would probably never realize you would miss, until you do. 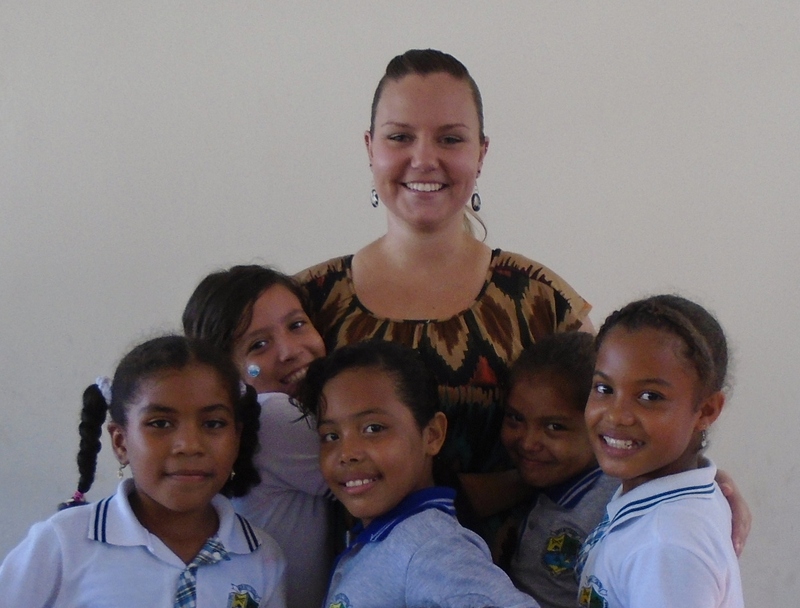 I would gladly give these things up all over again to have the experience I have had here in Colombia! That being said….here are some things I am looking forward to back home in the good old USA (where I will be in less than 2 months)! 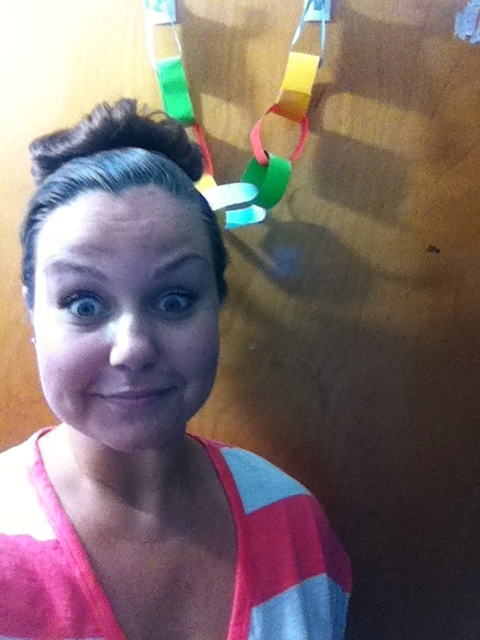 My countdown chain is shrinking fast! Appliances. For two years my only option to cook was the stove and doing laundry involved buckets of water, a bar of soap, and a clothesline. I am most excited to use the toaster, washer/dryer, microwave, and oven. Garbage disposals are something I completely forgot existed until a friend pointed it out and suddenly I missed them a lot. No food can go down the drain here, and food scraps that sit around in bags in 100 degrees do not have the most pleasant of odors. Also, coffee makers. I have had enough instant coffee to last me a lifetime. This is what laundry day looks like! Hairstyles. After approximately 810 days of slicked back pony tails, I am pretty excited to get a haircut and then do something besides my current routine of wash it, sleep with it wet, and brush it into a pony tail as soon as I wake up. I have not used a blow dryer, curling iron, or straightener in two years and wearing my hair down without it being plastered to the sweat on my face will be a thrill. 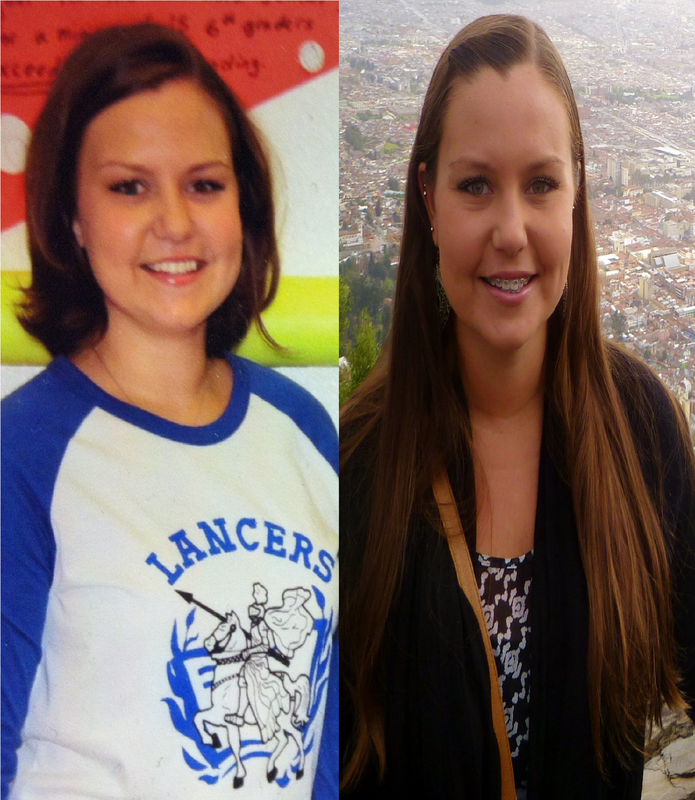 My hair has grown a LOT in the last few years, and I could only wear it down on vacation in cooler climates! Driving. The oven-like, mini-busses of death were fun for a while, but I really miss cars and driving. I am looking forward to knowing how long it will take me to get somewhere, not having to sit smashed against a sweaty stranger with my legs jammed against the seat in front of me, driving at a speed I feel is not endangering my life, not going deaf from honking horns and blaring vallenato music, and not being drenched in sweat by the time I reach my destination. 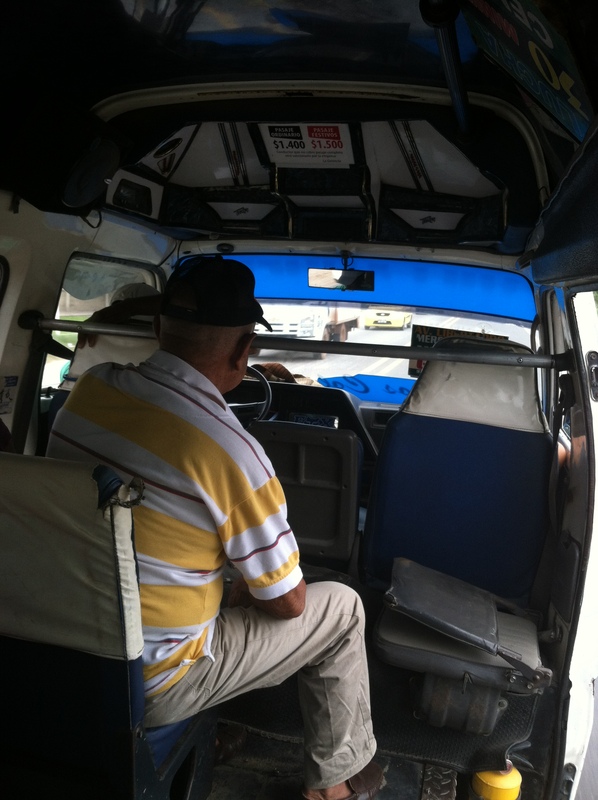 The inside view of a buseta (I am sitting in the death seat). 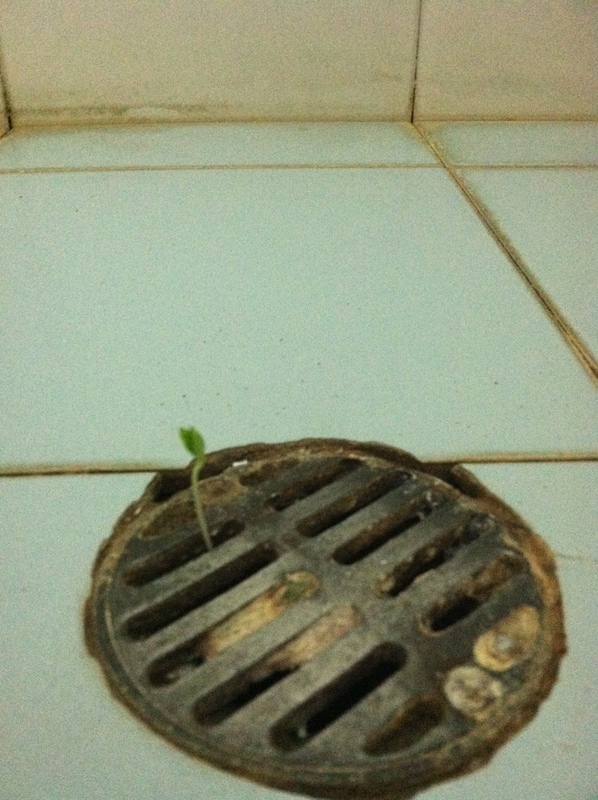 That one time a plant started growing out of my shower drain…. Water. Here, since the water is not potable and/or there is no running water, that involves either filtering, boiling, or lugging home bags of water. I am looking forward to being surrounded at all times by an unlimited supply of cold, clear, safe drinking water; whether it be from a public drinking fountain, that wonderful gadget on the front of the fridge, or simply the kitchen sink. And I will never take it for granted again. 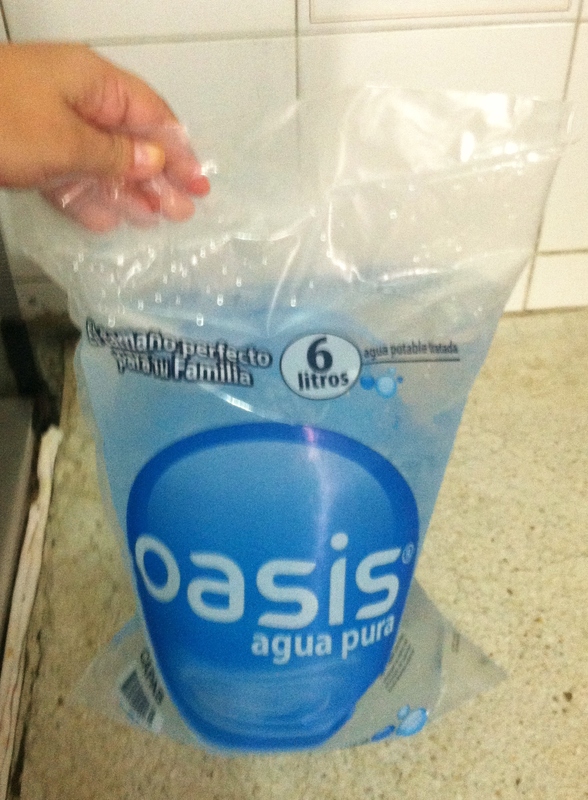 Lugging home 6 L bags of water helps you be more conscious of how much water we use! Food. I feel like this goes without saying. I’m sure you have all been on a vacation at some point. You know how when you get home you are all like, “Man, all that interesting and worldly food was awesome, but let’s hit up Chipotle pronto!” Now multiply that by 27 months. I have some pretty serious cravings for things I haven’t had in the last two years. Top of the list are: Chipotle, bagels, greek yogurt, Paradise Bakery, cottage cheese, berries, and asparagus. And yes, that is just the top of the list. 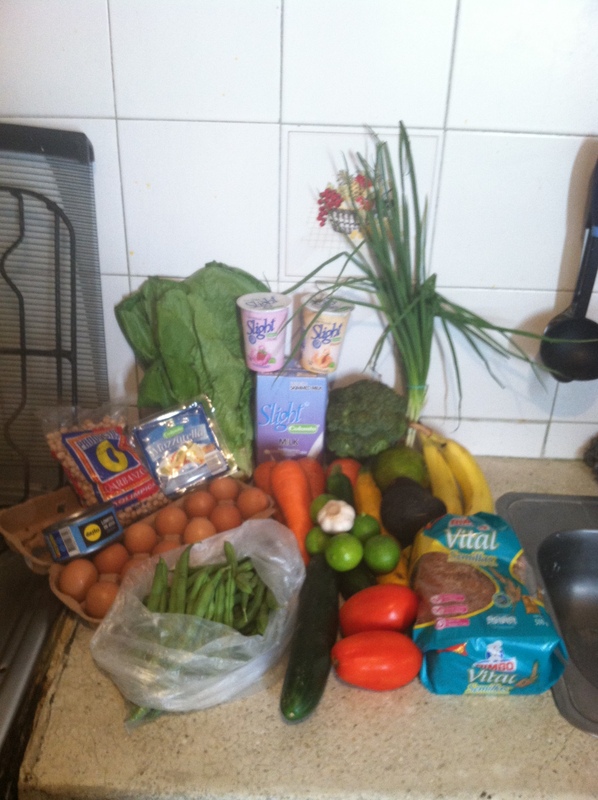 My grocery haul is basically the same each week plus an occasional meal out. 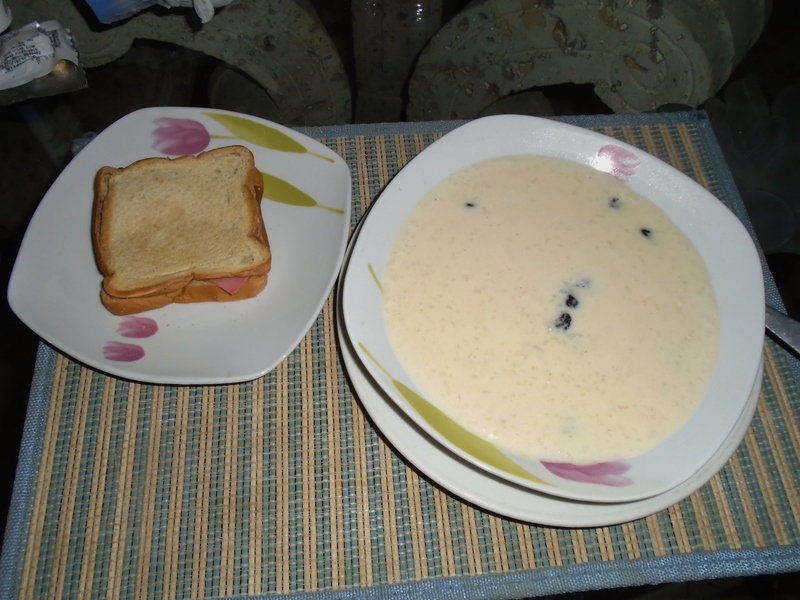 I love the foods that are available here, but there are lots I miss from home too! My Colombian dream come true. People. Overall I am so happy to say that my service has been incredibly positive. That being said, I missed my friends and family so much I can hardly put it into words. I missed out on so many life events during these two years. My best friend got married, Heidi went up to doggy heaven, my parents celebrated their 25th wedding anniversary, my cousin gave birth to a beautiful baby boy, my grandpa passed away after 92 wonderful years of life, my best friend of 18 years moved away to start a new career, and my little sister turned 21 (then 22, and now almost 23!). 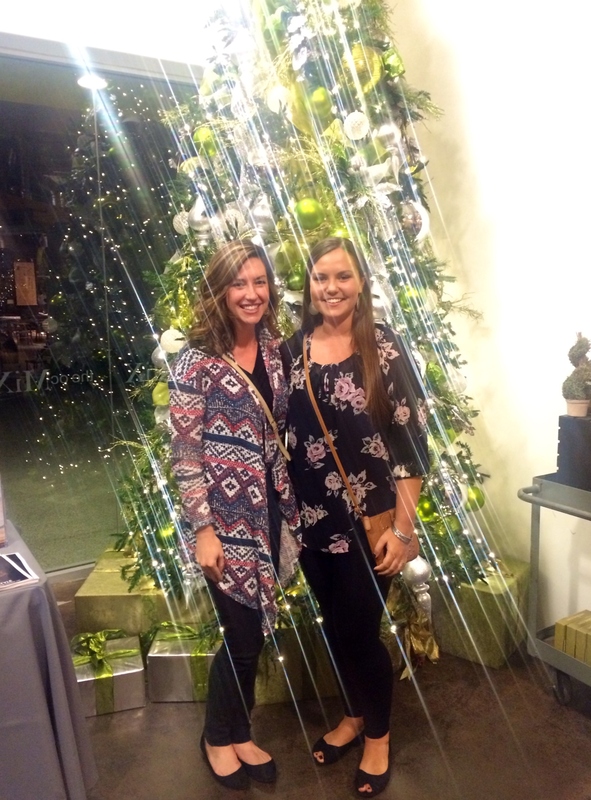 I celebrated three birthdays and two holiday seasons away from home. In addition to the big events, I missed out on millions of little moments in the lives of those that I love. While I wish I could have been there for all of these things, I knew coming into this I was making a decision to sacrifice those moments for this experience, and I do not regret that decision. 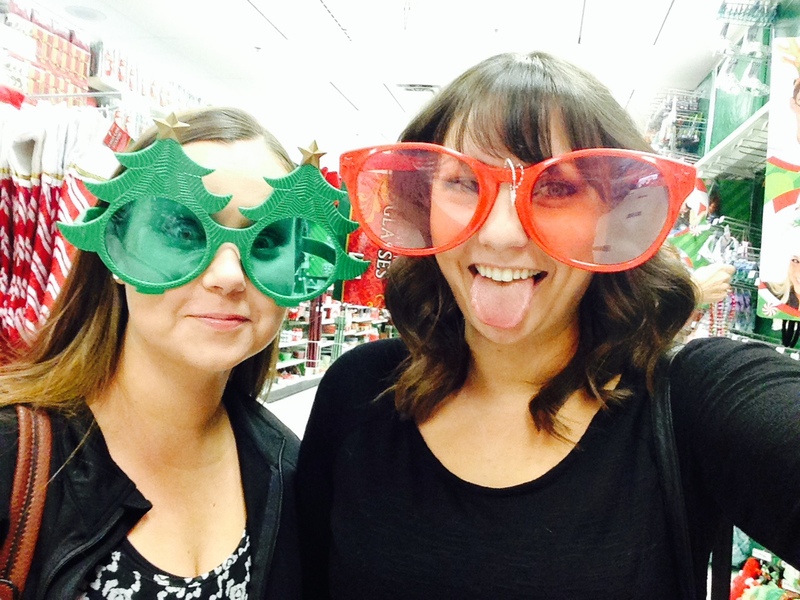 All of that said, the thing I am looking forward to the MOST is spending time with people that I love. Being away from my family has been hands down the hardest part of this experience. The saying ‘absence makes the heart grow fonder’ has never held so much meaning for me. I could not have done this without the overwhelming support of my family and friends and I am looking forward to being reunited with them more than anything else. 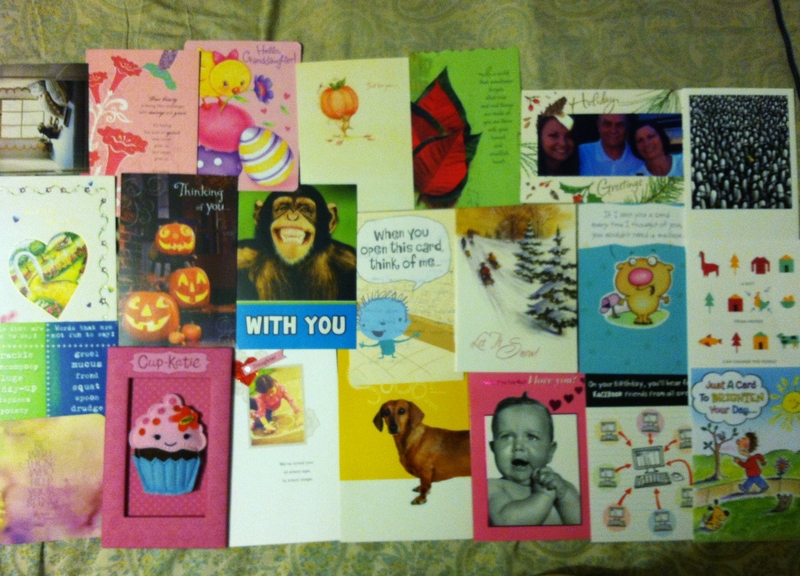 Some of the many cards sent by wonderful friends and family over the last two years! In case you missed it, be sure to check out Part I of this blog post where I share all the things I am going to miss about Colombia! For everything I am looking forward to at home, there is something I will miss dearly from my home away from home. Colombia has without a doubt become my home over the last two years. 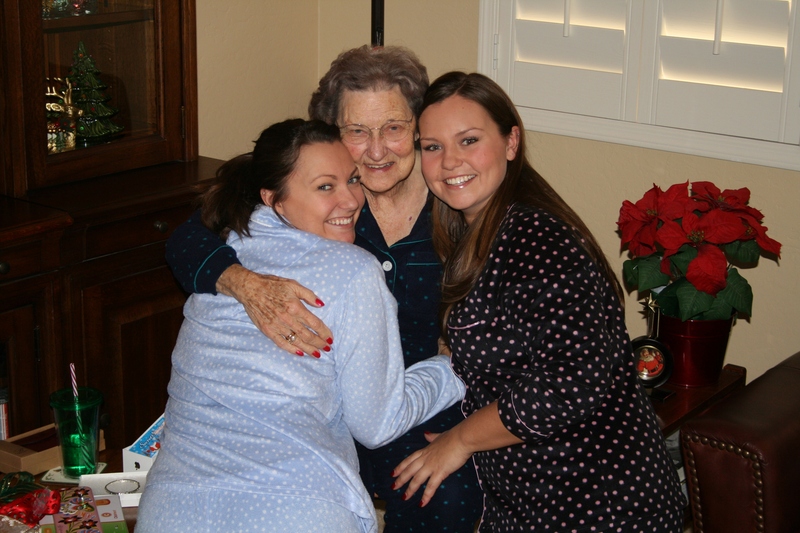 When we think of home, or being away from home, one of the first things we think of are the things we are going to miss! 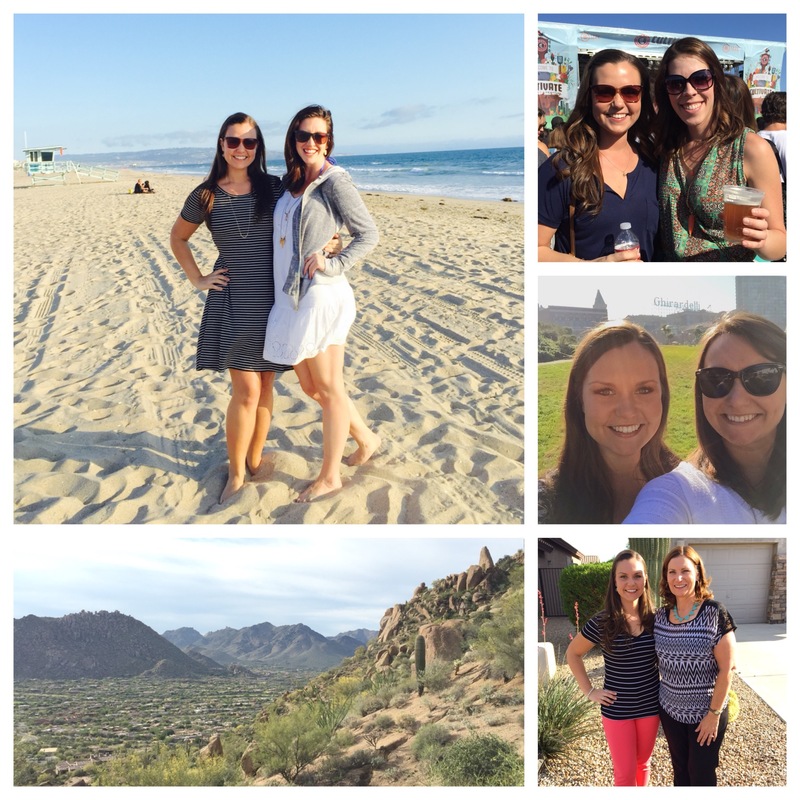 There are MANY things I will miss from my home here on the coast, but here are a few that I will miss the MOST! 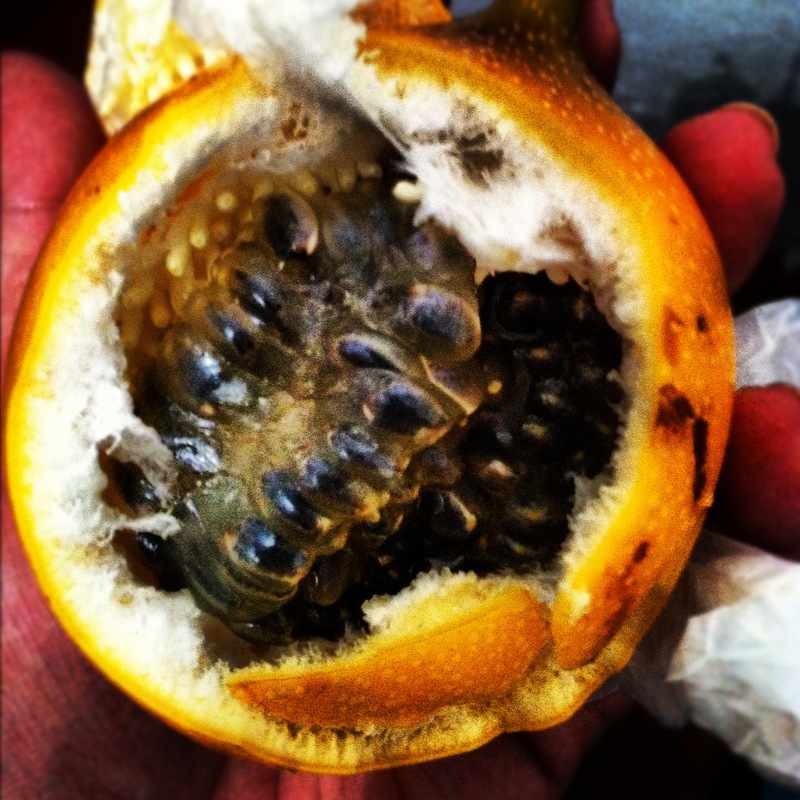 -Tropical/Exotic Fruit. Colombia brought my fruit game to a whole new level. 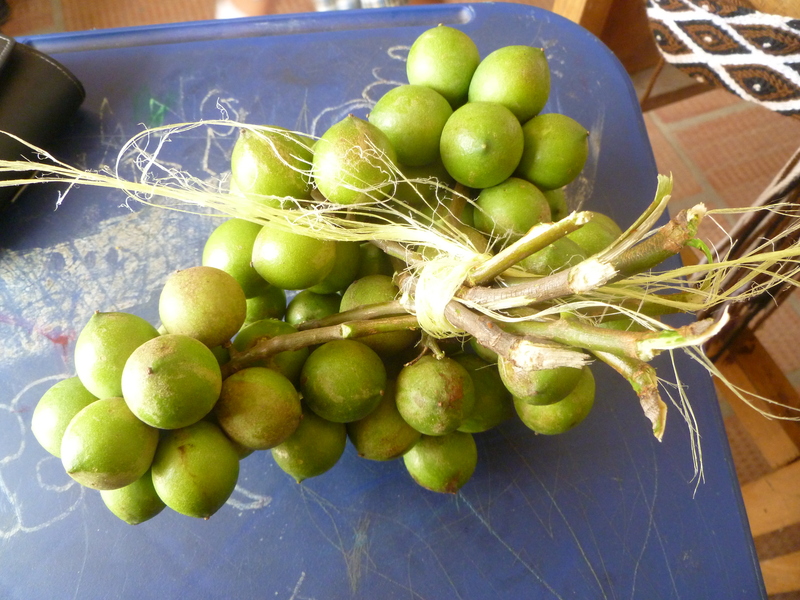 Some of my favorites were lulo, maracuya, tomate de arbol, guayaba, corozo, mamones, and my beloved uchuvas! There were also a few fruits that I did not care for like nispero (okay when blended into juice, but as a fruit it tastes like pumpkin pie and fails in my book), and granadillo (a hard shell full of giant snot covered seeds). 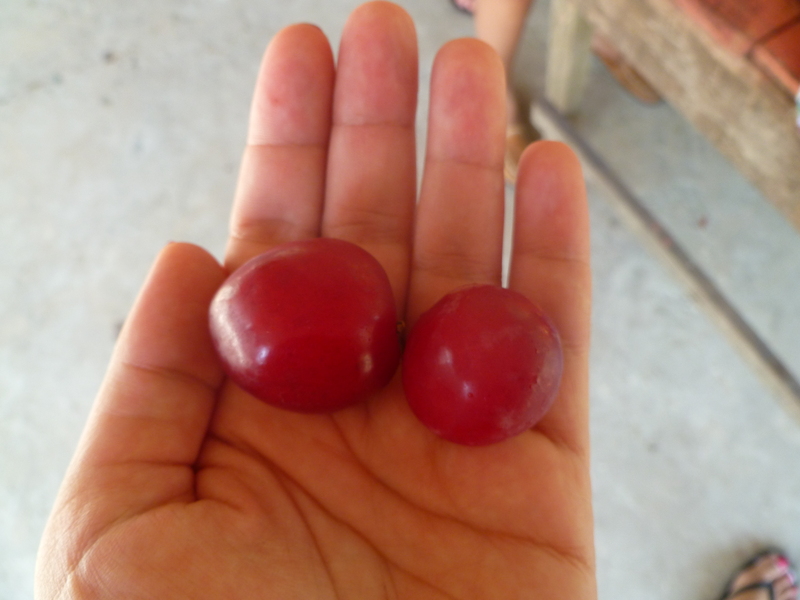 Ciruelas..these are the Colombian version of plums. Mamones…hard green shell that you crack open to reveal orange fleshy fruit stuck to a big seed! -Alegria. Colombia was recently voted one of the happiest countries in the world and I am not surprised in the least. Despite any hardship they may have faced in the past or are currently facing, Colombians definitely know how to love life. It doesn’t matter if it is Monday morning at work, Sunday after church, or a Friday night; people are in a never ending good mood. Whether they are celebrating a birthday, gozar-ing Carnival, or simply sitting around drinking cervesas in plastic chairs—life is good. 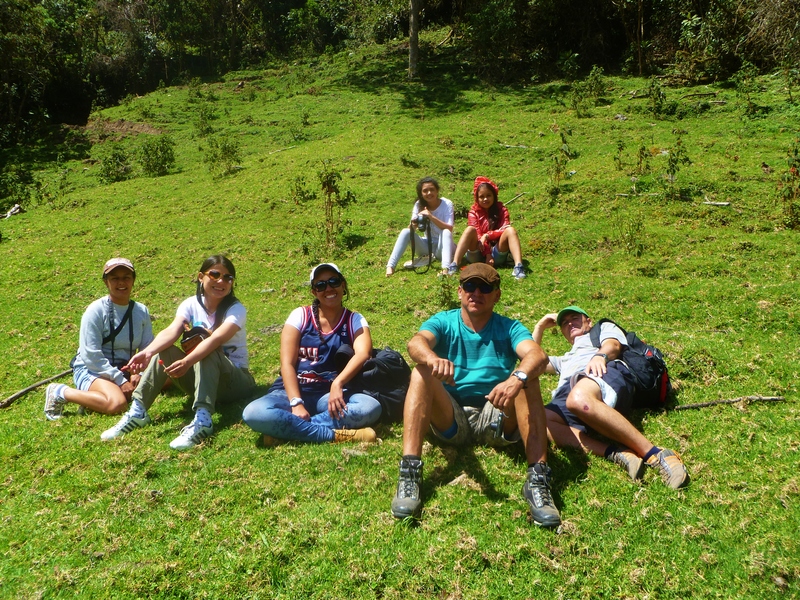 The happiest group of Colombians who took us on an 8 hour hiking adventure even though we were complete strangers! -Costeño time. If I am organizing a meeting at school and I say that it will begin at 3:00pm, someone will invariably ask, “Gringo time or Costeño time?” Gringo time means that we will start right on time, and you should arrive a few minutes before said time. Costeño time means that we will NOT be starting on time and it is perfectly acceptable to show up 30-45 minutes (or more) late. It is a slower pace of life here and that’s just fine, don’t worry—be happy! This meeting started at 10:00am. This photo was taken at 10:35am (and those 3 people are my family). Eventually, over 50 people showed up. -Music. You will rarely be anywhere that there is not music blasting out of giant speakers, but if by some random accident you find yourself in this music-less predicament, a Colombian will waste no time in whipping out their phone to play some! My two favorite genres of music that were born here on the coast are Vallenato and Champeta. I have all of my favorites loaded onto my ipod, so this is a part of Colombia I will definitely be bringing back home with me! 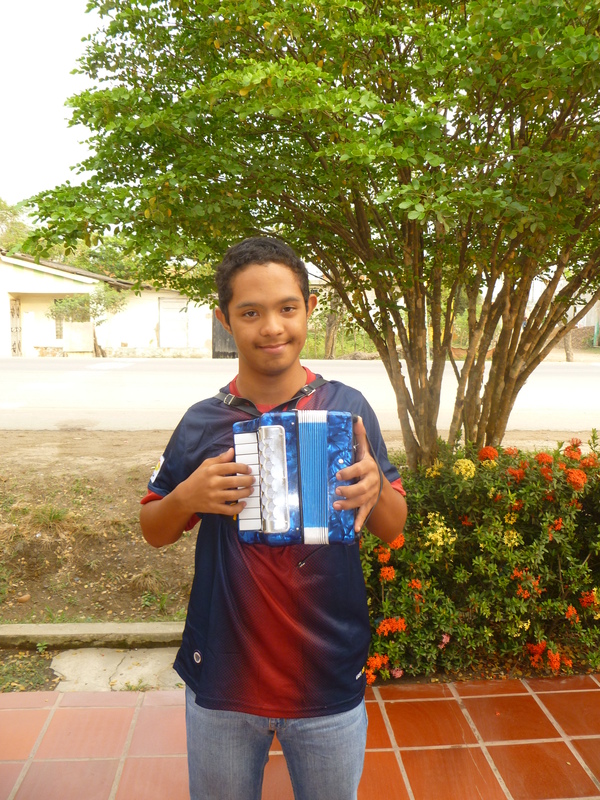 Juan Manuel is an aspiring vallenato star! -Beach life. I am surrounded by multiple beautiful beaches and happen to live in a climate that provides year round perfect beach weather! 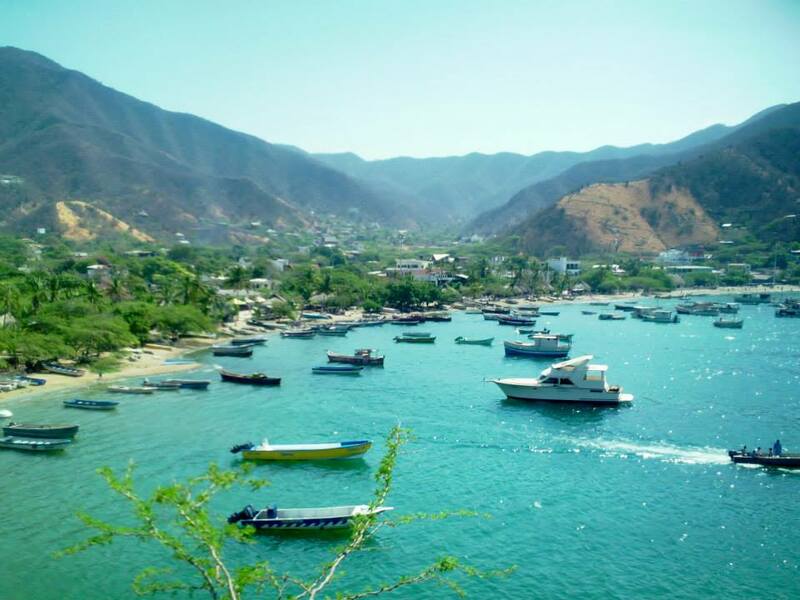 My favorite beaches are Taganga (a small fishing town over the mountain with a little beach and a very hippy-ish crowd), Rodadero (a fancy touristy part of town with lots of hotels and condos), and Bahia Concha (a bit of a trek to get to but worth it for the solitude and beautiful view). 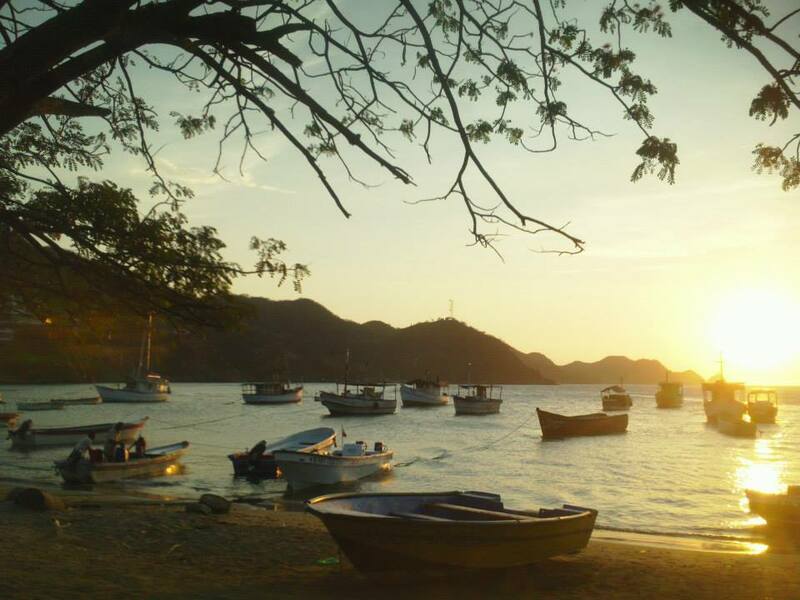 I also live about eight blocks from the bahia which is not great for swimming but provides beautiful views and a nice place for an early morning or sunset stroll! It doesn’t get any better than that! -Street Vendors. Whether you are hanging your head out the window of a bus to buy a paleta, stopping on the corner to grab a bolsa de agua, or wandering down the crowded quinta jammed full of vendors selling everything from nail polish to meat on a stick… it doesn’t matter what you want….there is definitely a street vendor who is selling it. 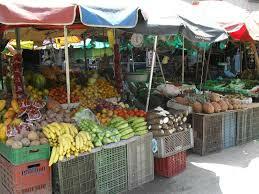 A stall in the mercado in Santa Marta. 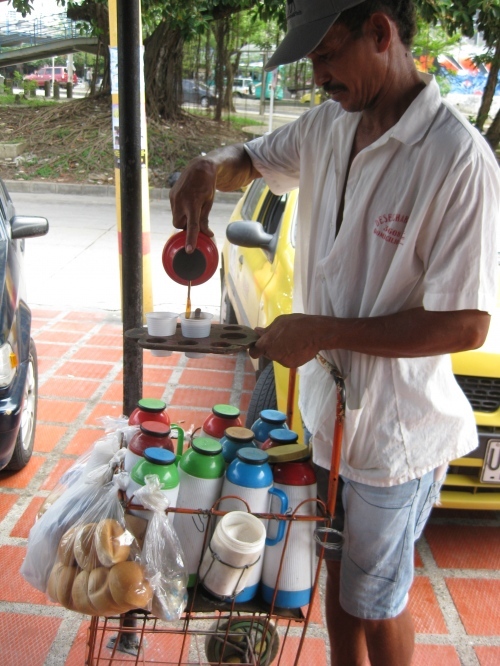 I can’t tell you how much I will miss the tinto vendors! Cheap coffee anytime/anywhere! -Futbol. I have never seen anyone as passionate about anything as Colombians are about soccer. I have watched countless games at tiendas, sub-15 and sub-20 games with my abuelo in Bayunca, and World Cup games in Bogota and Santa Marta. I learned how soccer actually works, got my own Colombia jersey, and developed an unrequited love for James Rodriquez. I am sure I will continue to follow Colombian soccer back home, but I will really miss being surrounded by the passion and excitement of watching a game with a room full of Colombians. 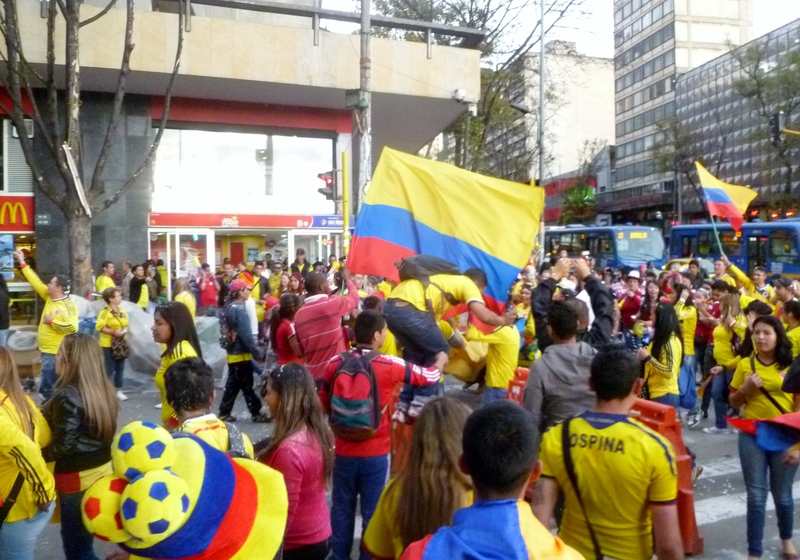 Chaos in the streets after a Colombian victory! -Challenge/Adventure. When I arrived to Colombia two years ago I spoke virtually no Spanish, had never been to South America, and was three thousand miles from everything that I knew. Every day provided a new challenge and even the smallest tasks felt like little adventures. 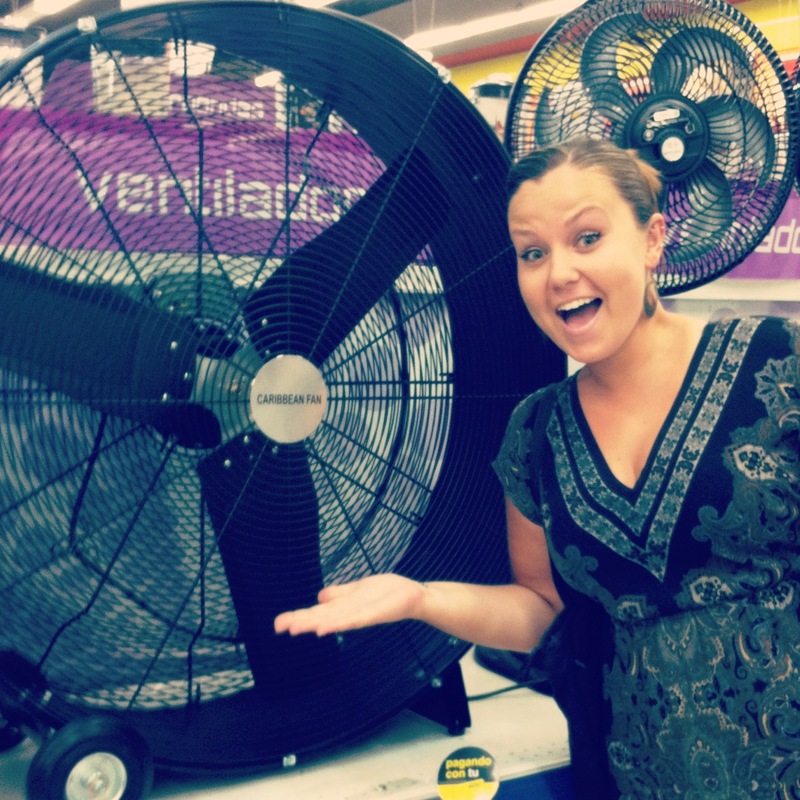 While most things have become routine for me now, there are still random and crazy things constantly happening that challenge me to be flexible and maintain my sense of humor. I will miss the randomness and excitement that comes with living abroad and experiencing new things each and every day, and I am thankful for the wonderful (and often hilarious) memories that I have made these past two years. 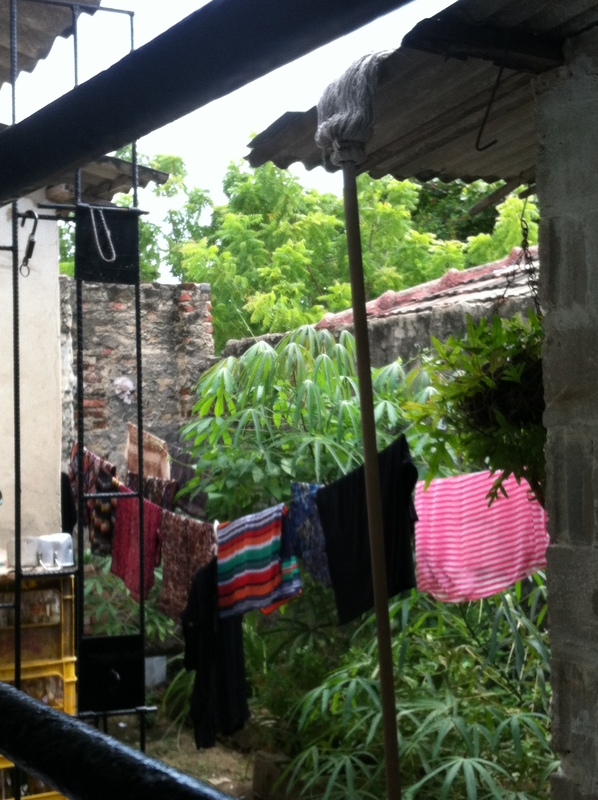 Two years ago after the first time I successfully hand washed all of my clothes outside and hung them to dry! After two years, I am a pro! -People. 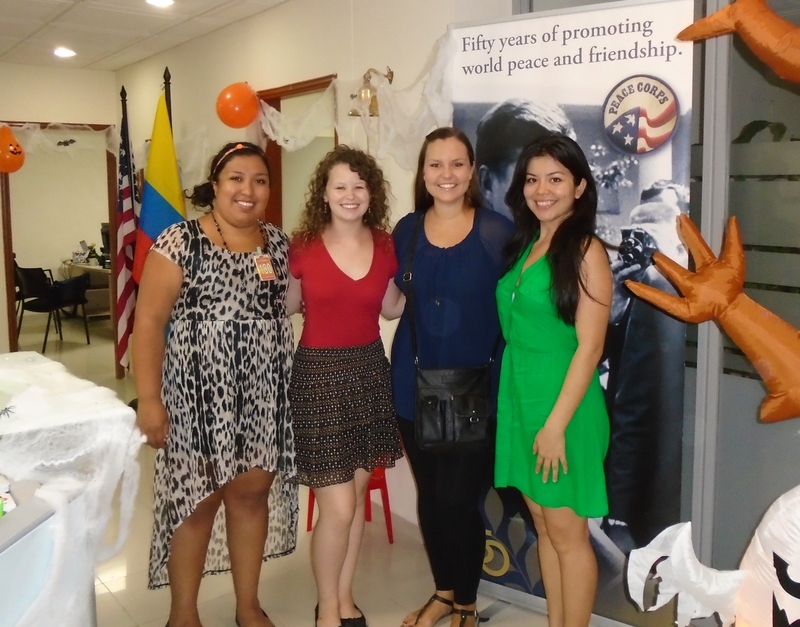 My fellow Peace Corps Volunteers, Peace Corps staff, Colombian friends, host family, co-teachers, colleagues, students, the porteros, the fruit man on the corner, the lady at the tienda, and every other random Colombian I have had the pleasure of interacting with over the last two years. 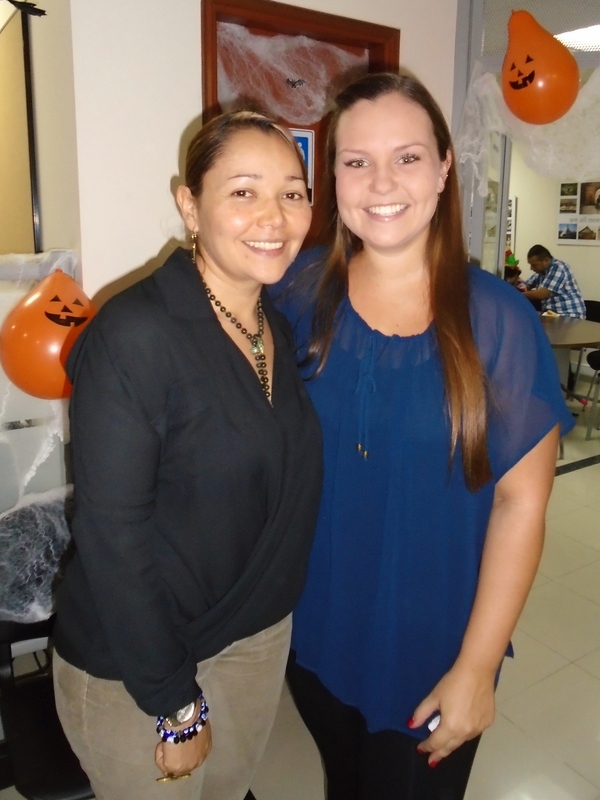 I came here with the expectation that I would be teaching English and teaching methodologies. I had no idea the profound impact the people I lived and worked with would have on me. In my ‘Commitment to Service’ at the beginning of my two years, my closing statement was, “I promise to do my best to learn the language, take part in a cultural exchange, keep smiling, and get busy working alongside strangers who will become family, in a country that has already begun to steal my heart away.” If I thought a part of my heart belonged to Colombia then, after a mere three months, the love I feel for this country and the people I met here today is indescribable. 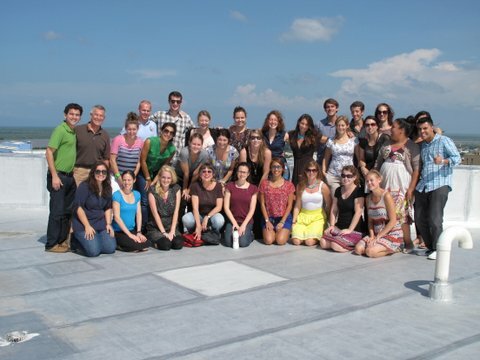 These people have made my Peace Corps service a life changing experience and I will be forever grateful to them. 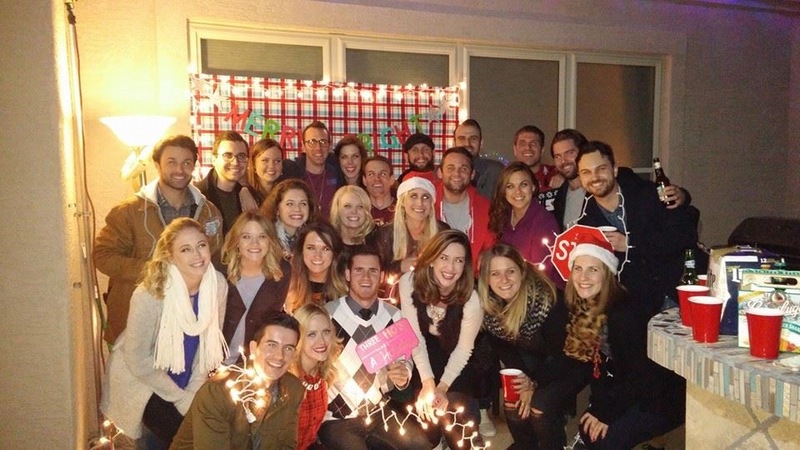 Too many people I love to post pictures of everyone….but this group is at the top of my list! CII-4 love! That’s it for part I of this post, but be on the lookout for part II coming soon featuring the things I am looking forward to back home! 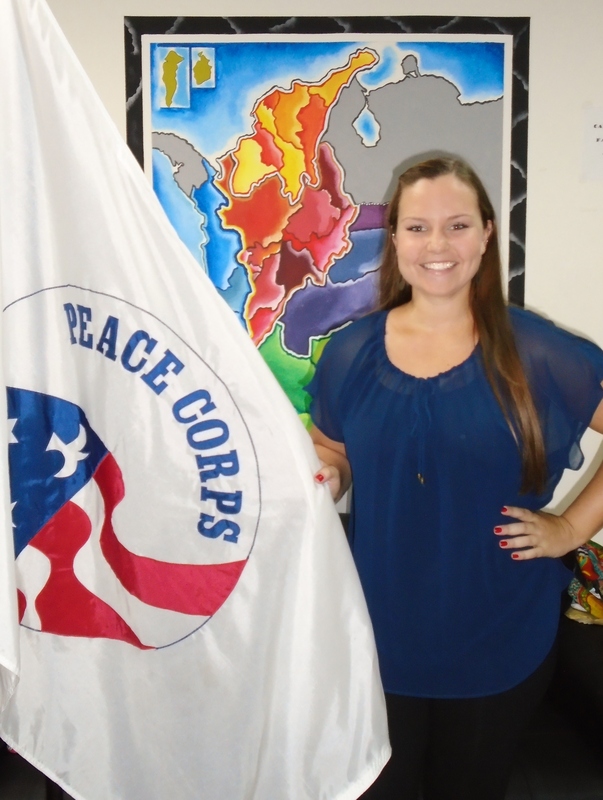 While Peace Corps is commonly referred to as a two year service, it is actually 27 months when you include the three month pre-service training. That means that anything that happens during those first few months will happen THREE times during your service instead of just two. 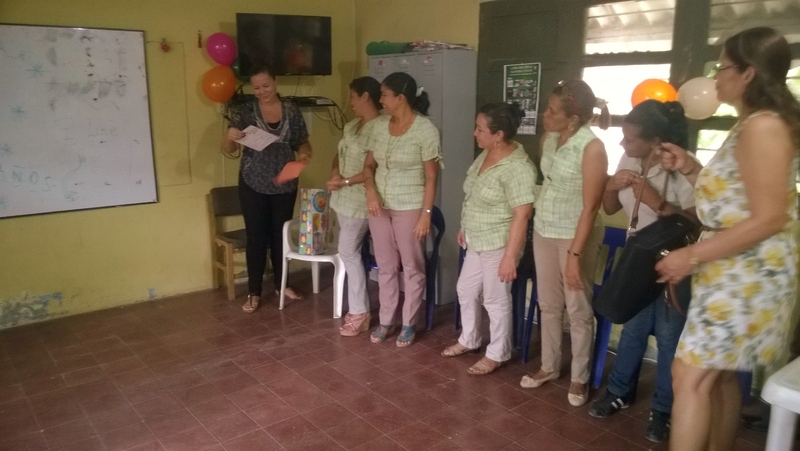 For me, since I have a September birthday, I got to celebrate three birthdays here in Colombia. 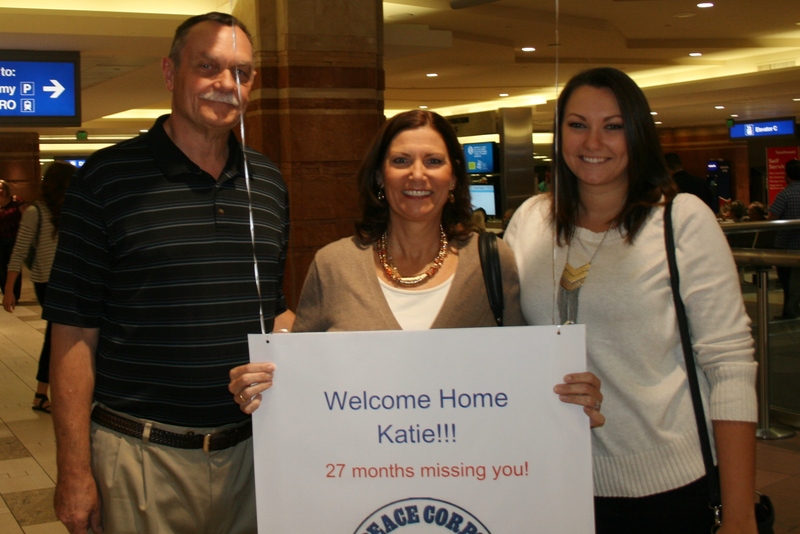 I left home when I was 22 and I will be returning as a 25 year old! 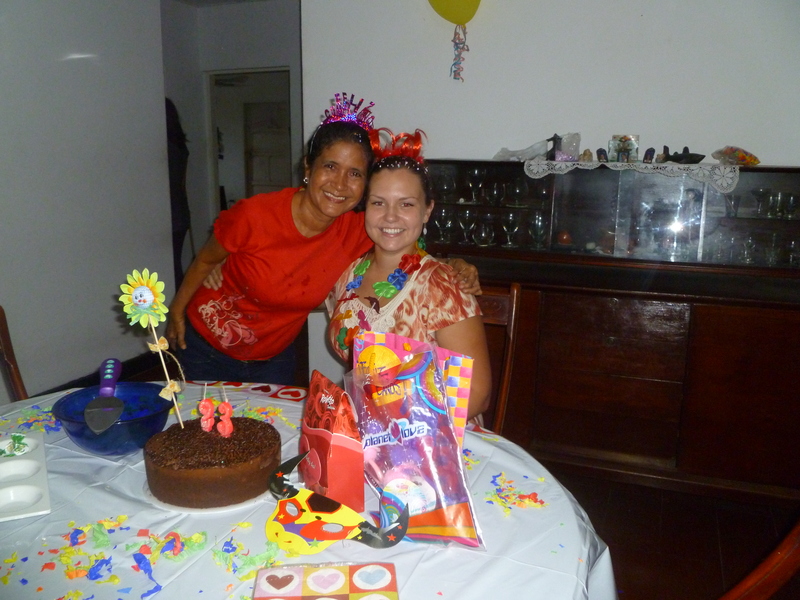 Throwback to my first birthday in Colombia! 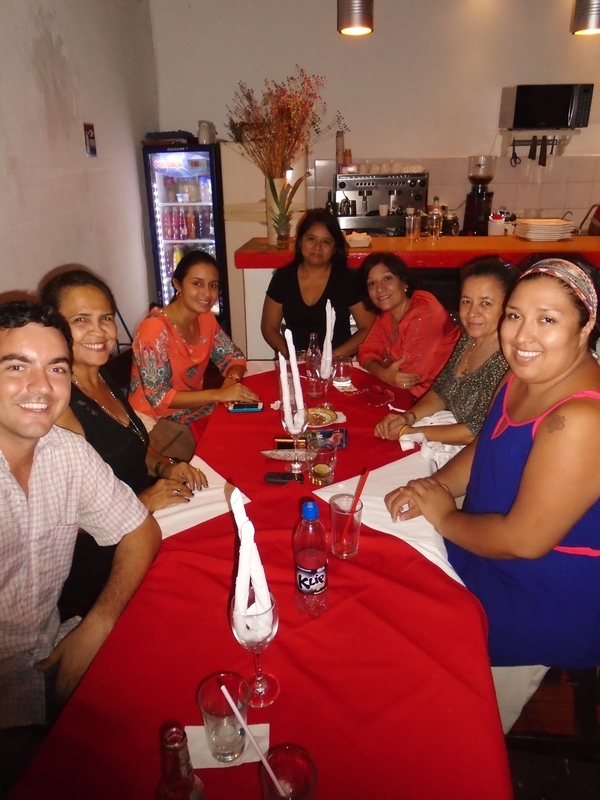 I spent my first Colombian birthday with my Barranquilla host family dancing, eating, and learning how Colombians throw a fiesta! 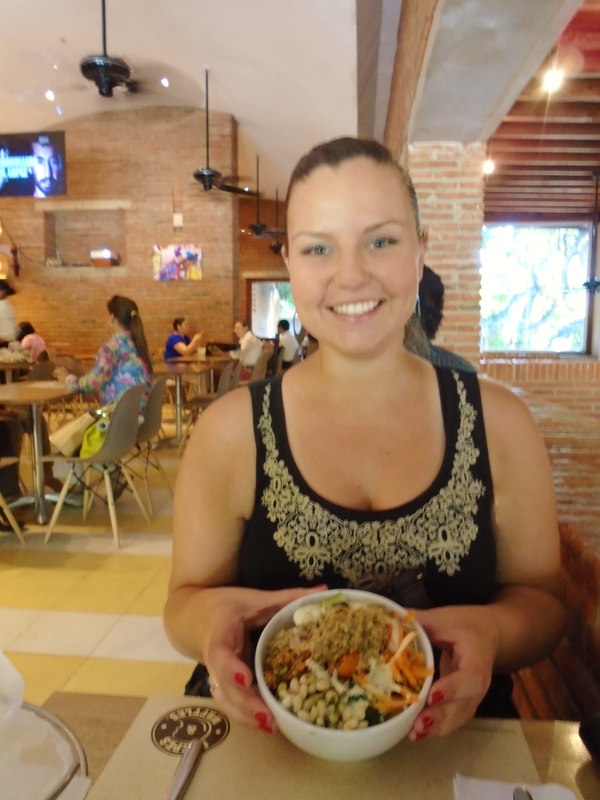 My second birthday here was spent in Santa Marta where I celebrated with friends at happy hour and treating ourselves at a sushi restaurant. The whole week of my birthday last year was a national teacher strike, so I wasn’t at school all week and therefore none of my teachers or students knew it was my birthday! 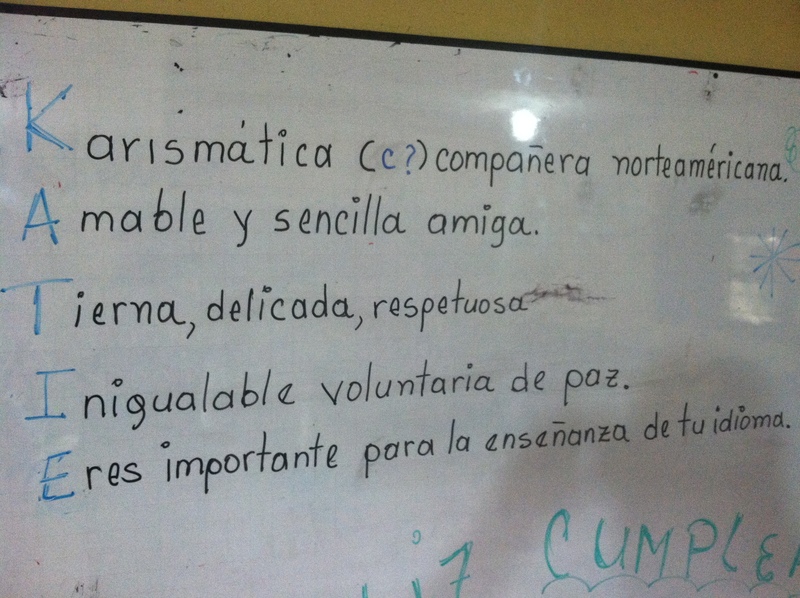 An acrostic poem by my teachers! This year on my birthday, there was a transportation strike (something about my birthday apparently instigates strikes…) so school was canceled. I started the day by having some coffee with Dana and our favorite barista Karina at Juan Valdez, spent the afternoon seeing a movie (in ENGLISH!) 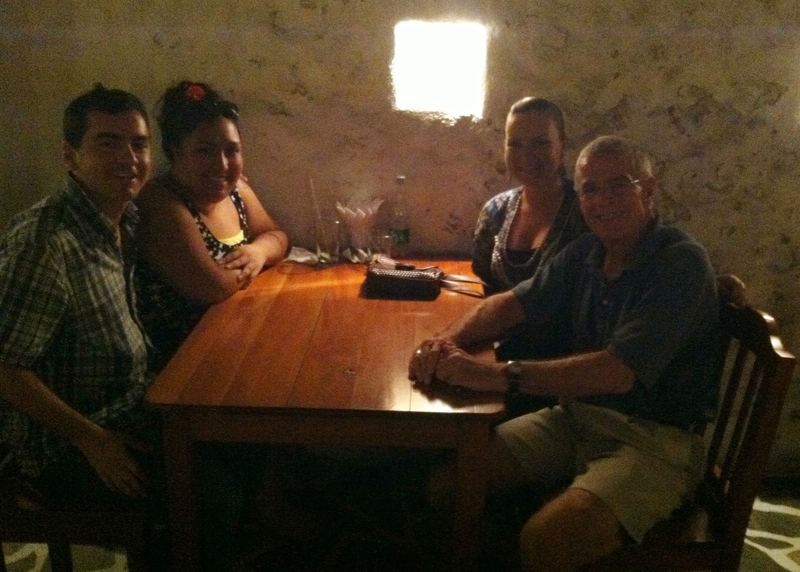 with Nina, and ended the day at one of my favorite restaurants called Ouzo with some other volunteers! When I got home, I Skyped with my parents and opened the birthday package they sent me. I got a bunch of treats like almond butter and face masks! 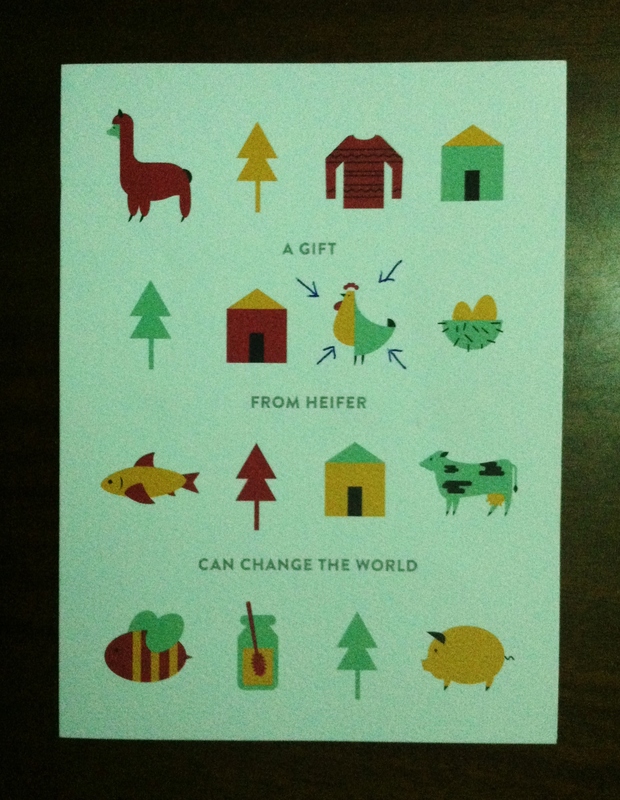 The best part of the gift was the card that explained my parents had made a donation to an organization called Heifer International and that a flock of chicks had been donated to family in need! 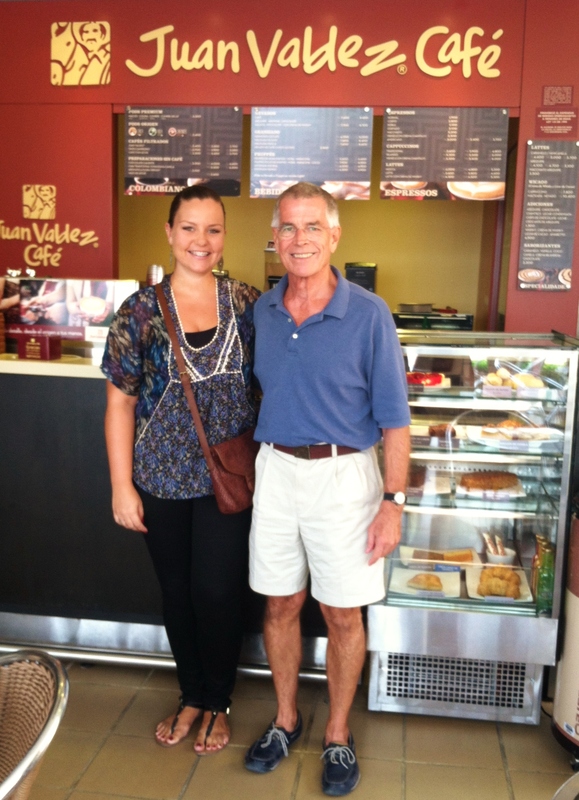 Dana and I at our favorite place for coffee and air conditioning! 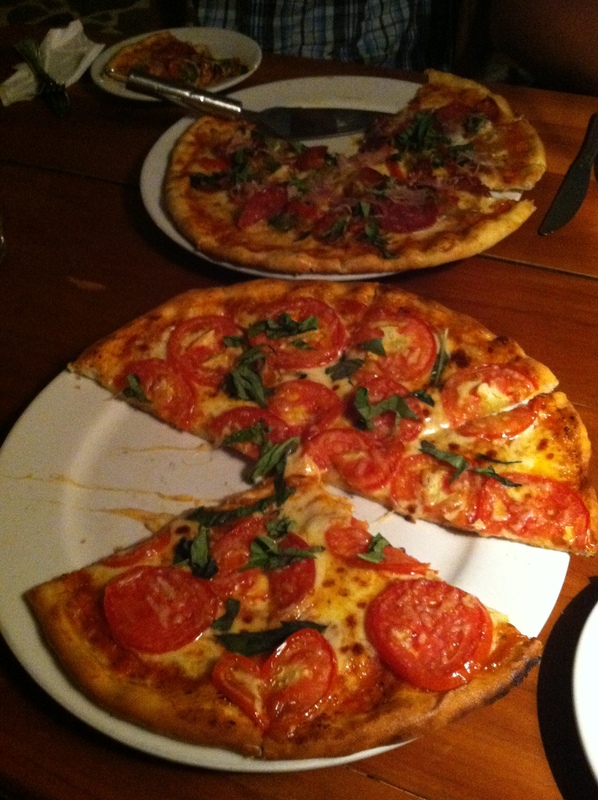 American (or I guess I should say Italian) style pizza at Ouzo! Nina, Andrew, Dana and I at my birthday dinner! 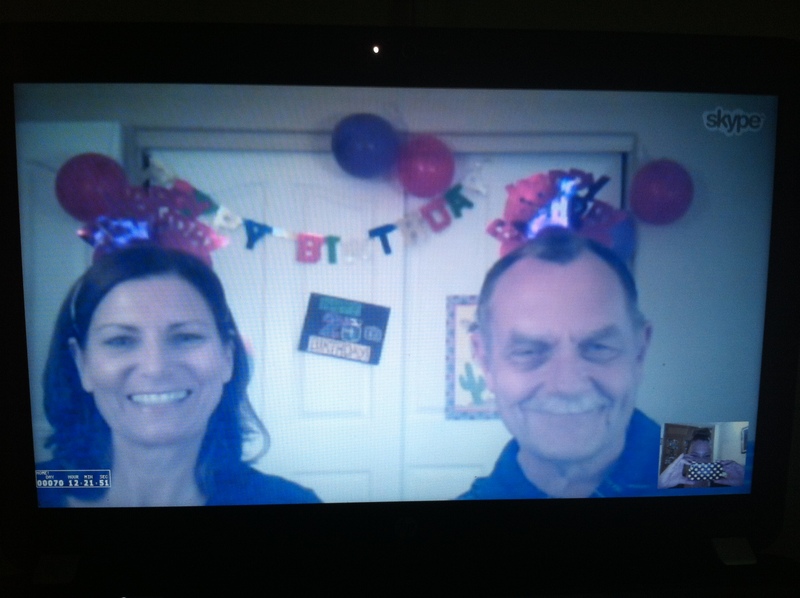 Birthday Skype date with the padres complete with hats and decorations! Opening the card signed by all the staff at my school. Me with Emma, who gave the pre-gift speech. 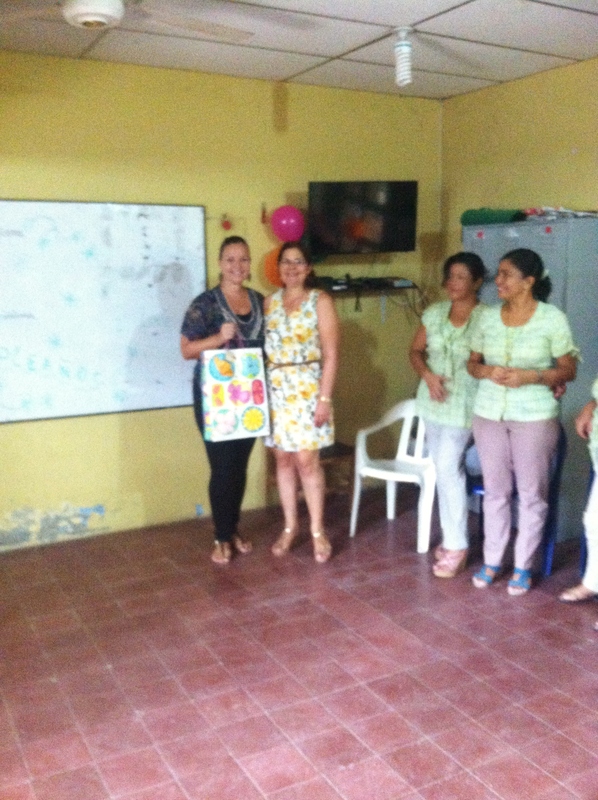 It is not the norm for the teachers to receive gifts when they celebrate birthdays at school, so I was surprised when they pulled out a big birthday bag! One of the high school teachers got up and gave a very nice speech saying that as a group they not only wanted to wish me a happy birthday, but also thank me for everything over the past two years. She said many very kind things and I got a little emotional before people started screaming ‘open it! open it!’. I opened up the bag to find the most beautiful mochila which is something I have wanted the whole two years I have lived here! While there are a variety of mochilas available here in Santa Marta and around Colombia, this bag was the one I had my heart set on. Through careful questioning over the last few months, my teachers managed to discover my obsession with these mochilas and decided to give me one for my birthday so that I could ‘carry a piece of Santa Marta with me forever’. 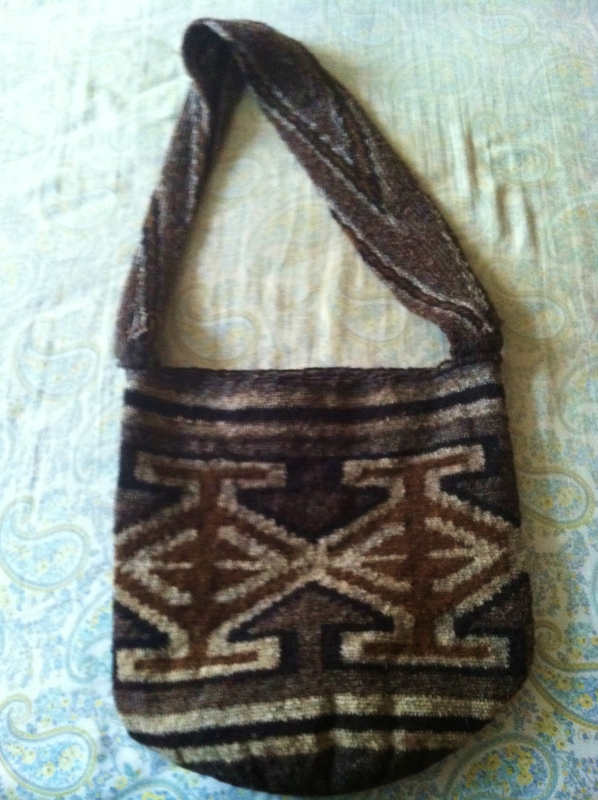 This type of mochila is made by the women of an indigenous group in the Sierra Nevada mountains called the Arhuacos. The bags are handmade of 100% virgin sheep wool by the women in the Arhuaco community and it can take more than a month to weave a single bag. I was told by my teachers that each bag is representative of the Arhuaco culture and has been blessed. The particular bag I received was made by a friend of one of my teachers. It is a beautiful gift that is full of meaning for me and I know that each time I carry it in the future, I will be reminded of my time here in Colombia. I received so much love both here in Colombia and sent from back home, so thank you to everyone who helped make my last Colombian birthday a memorable and special day!